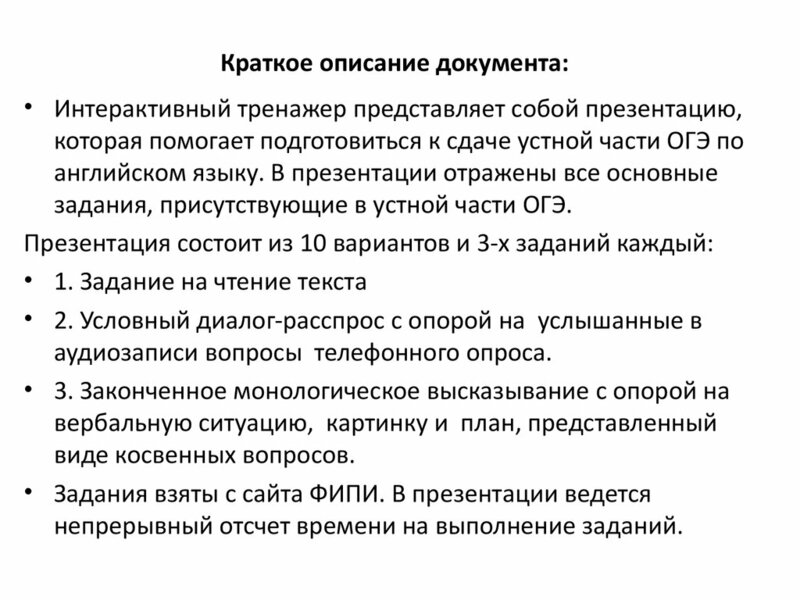 задания, присутствующие в устной части ОГЭ. 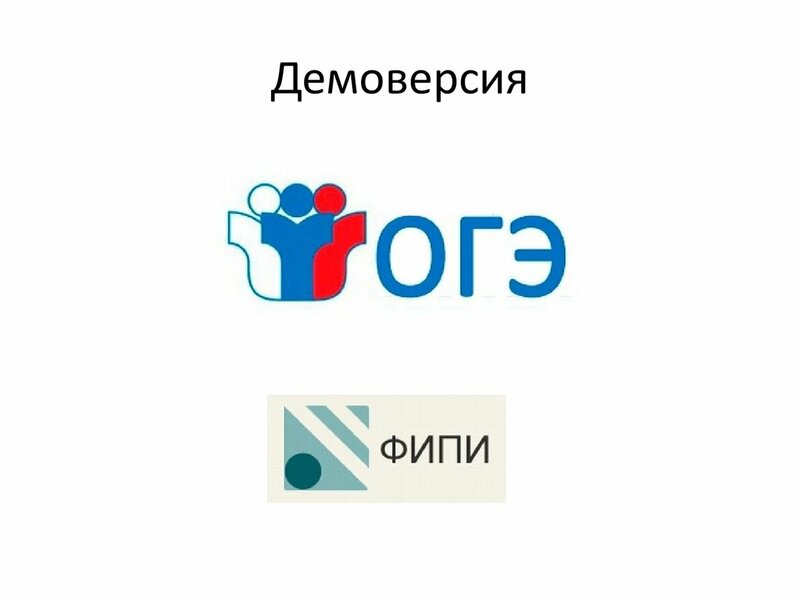 непрерывный отсчет времени на выполнение заданий. 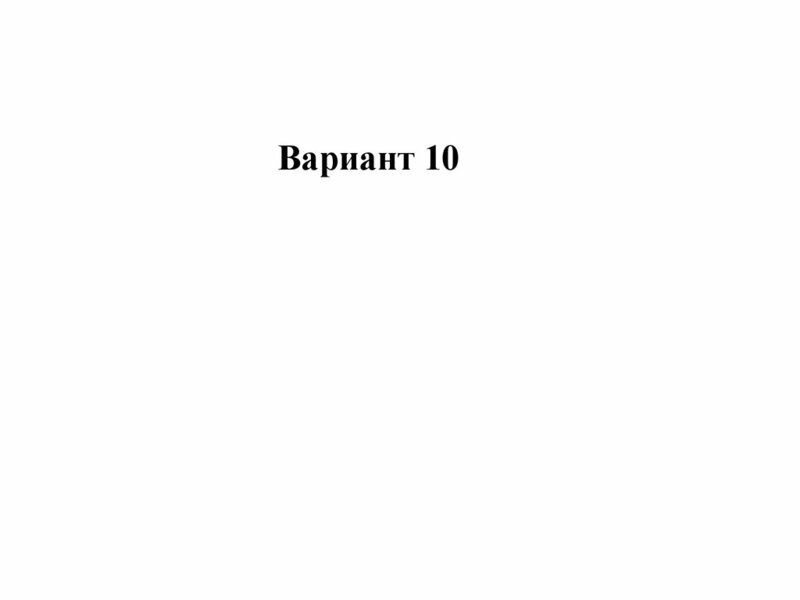 характера. Время на подготовку - 1,5 минуты. на определённую тему с опорой на план, представленный в виде косвенных вопросов. Время на подготовку - 1,5 минуты. 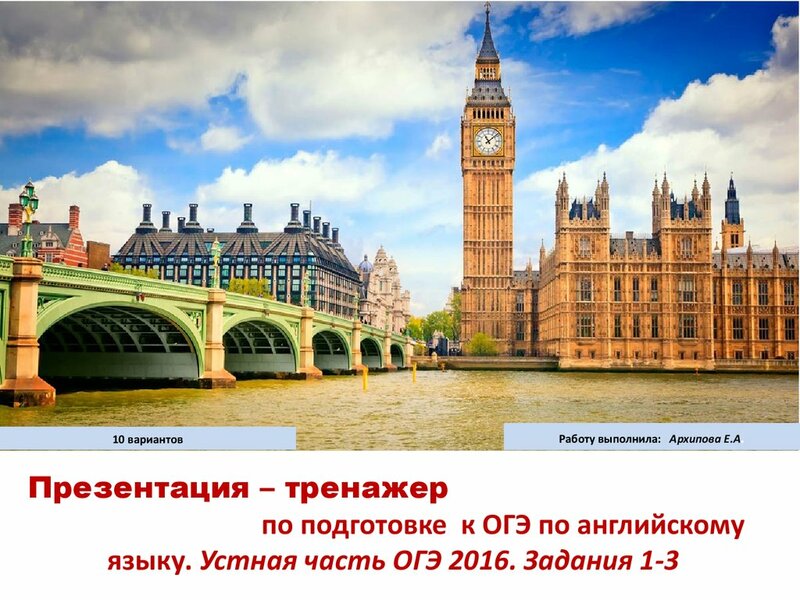 * Общее время ответа одного участника ОГЭ (включая время на подготовку) - 15 минут. * Каждое последующее задание выдаётся после окончания выполнения предыдущего задания. * Всё время ответа ведётся аудио- и видеозапись. 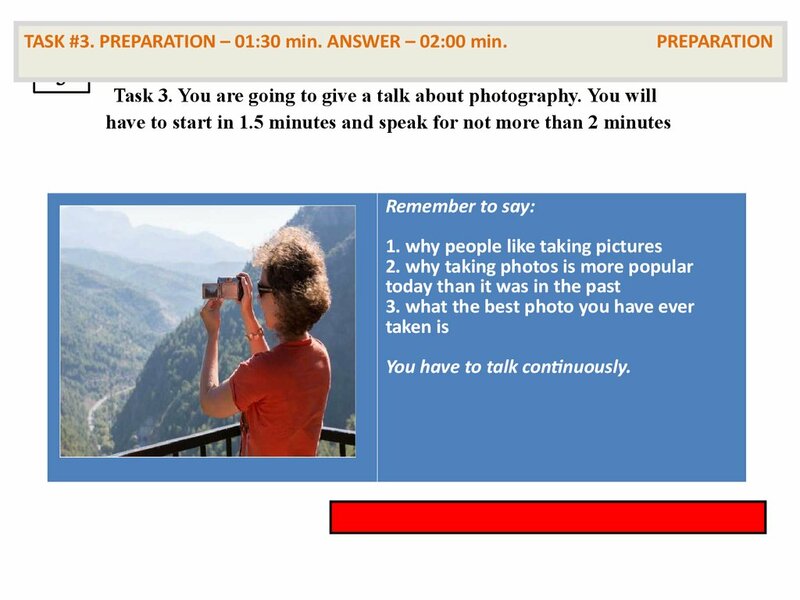 TASK #1. 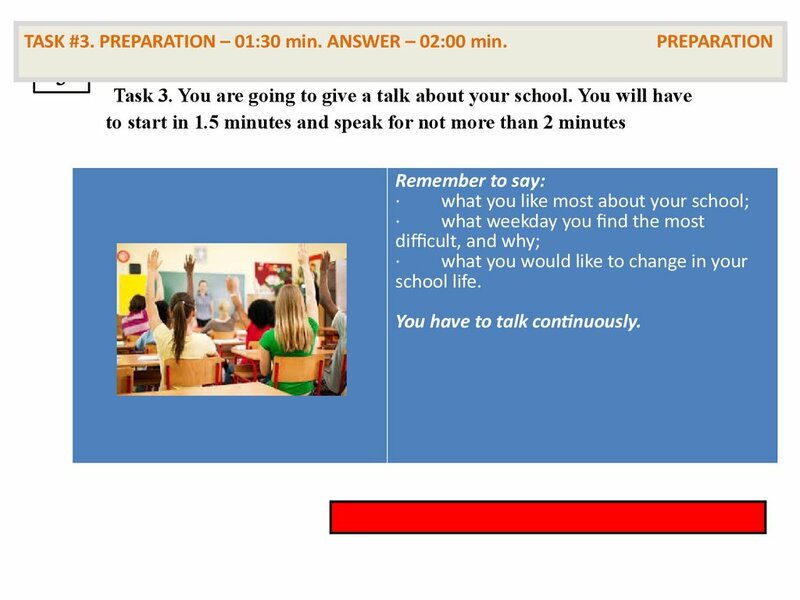 PREPARATION – 01:30 min. 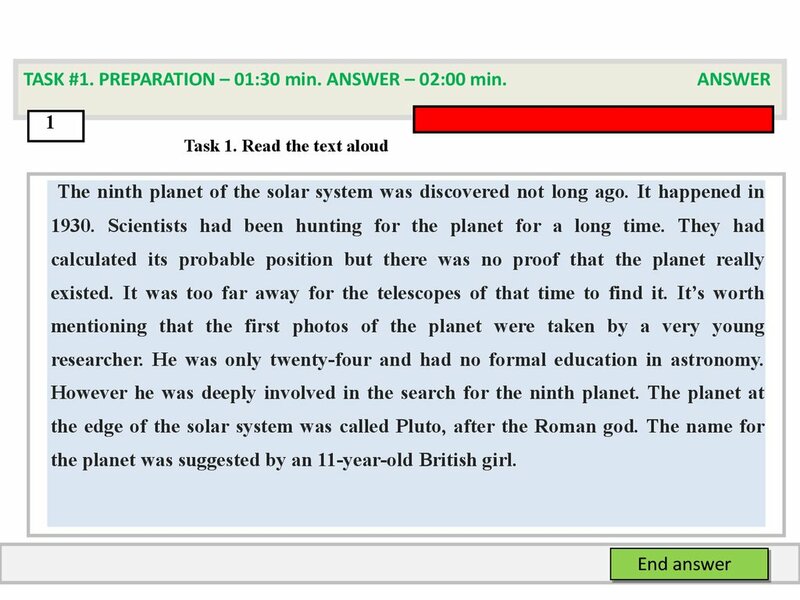 ANSWER – 02:00 min. some interesting material for the presentation and you want to read this text to your friend. have more than 2 minutes to read it. researcher. He was only twenty-four and had no formal education in astronomy. the planet was suggested by an 11-year-old British girl. 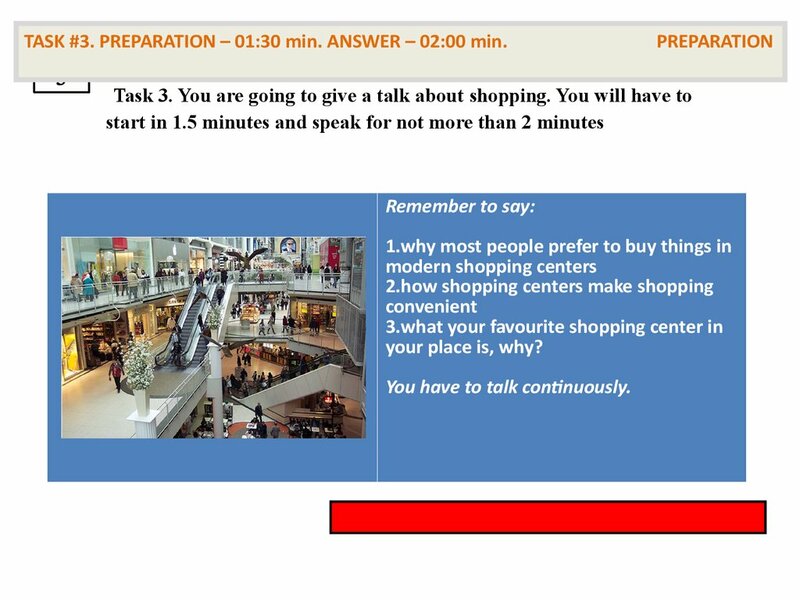 TASK #2. 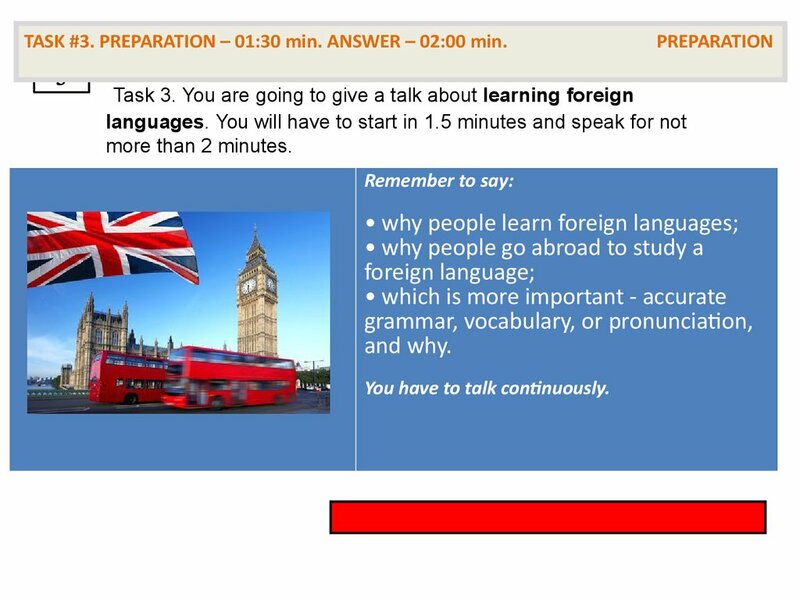 PREPARATION – 01:30 min. ANSWER – 01 min. Remember that you have 40 seconds to answer each question. 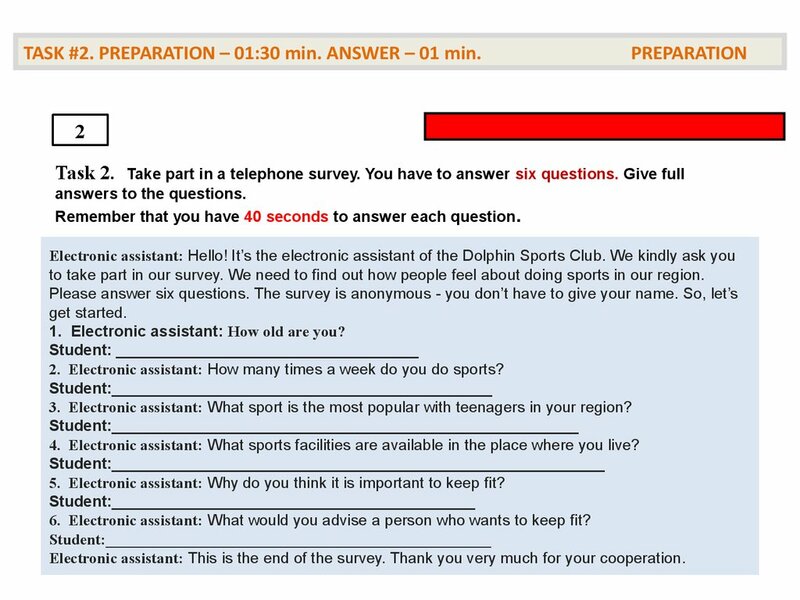 to take part in our survey. 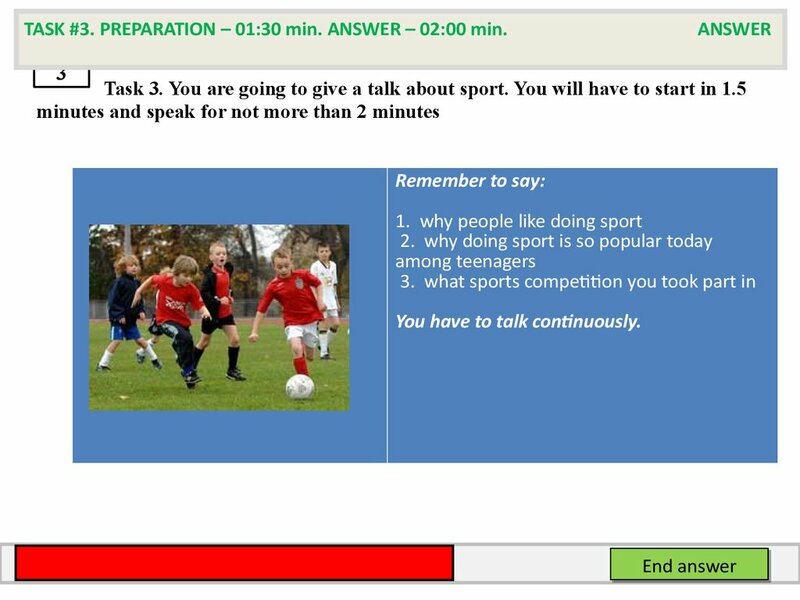 We need to find out how people feel about doing sports in our region. 1. 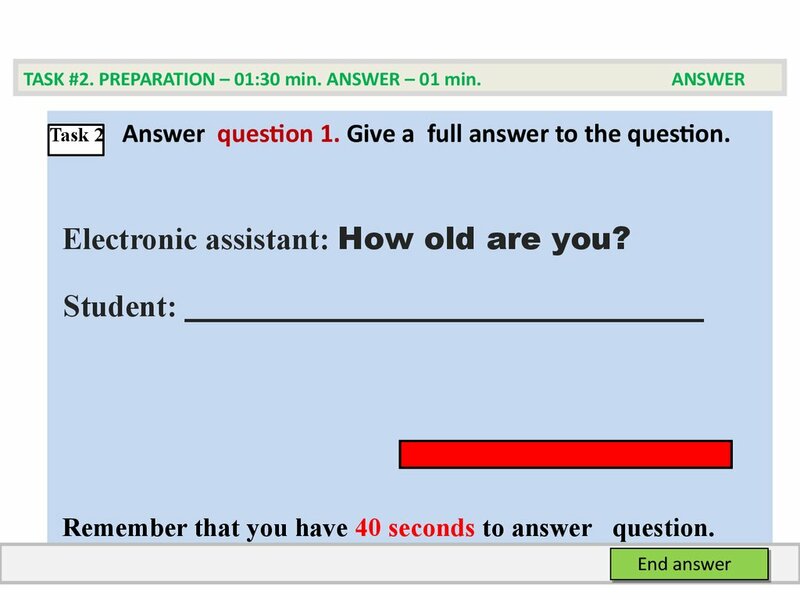 Electronic assistant: How old are you? 2. 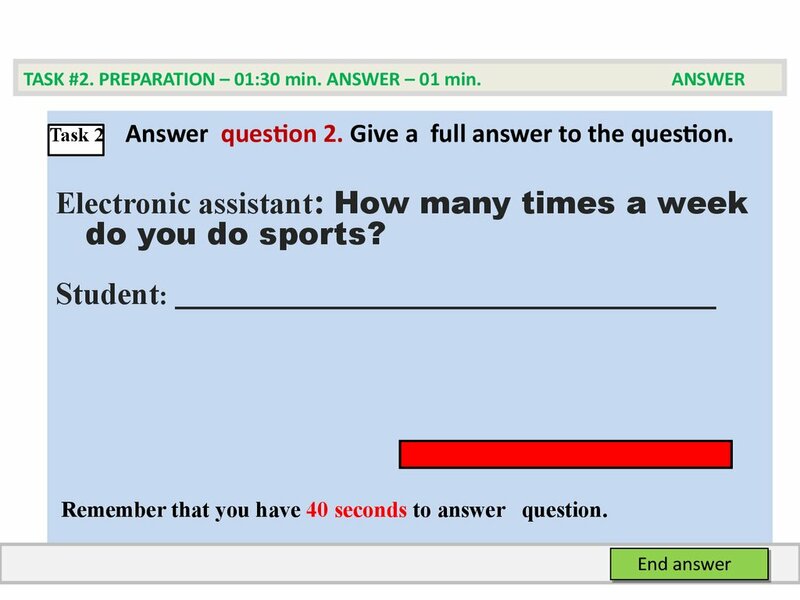 Electronic assistant: How many times a week do you do sports? 3. 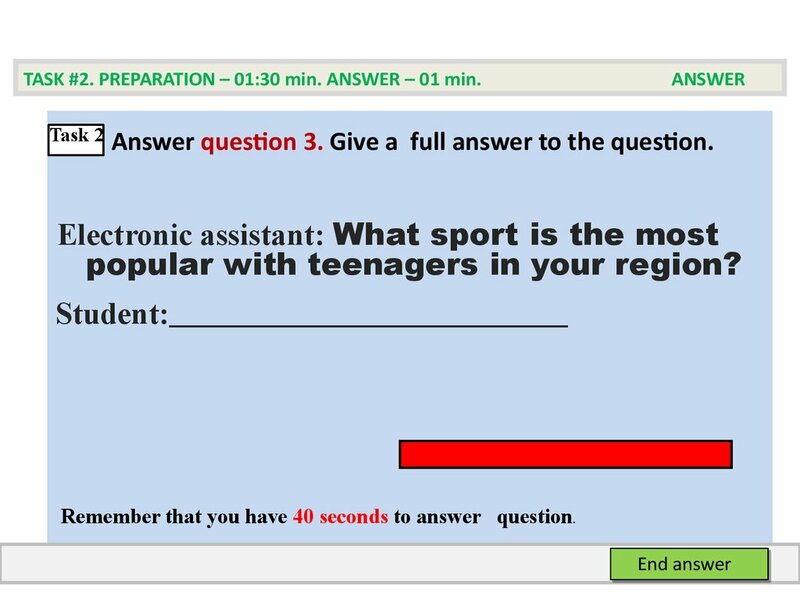 Electronic assistant: What sport is the most popular with teenagers in your region? 4. Electronic assistant: What sports facilities are available in the place where you live? 5. Electronic assistant: Why do you think it is important to keep fit? 6. 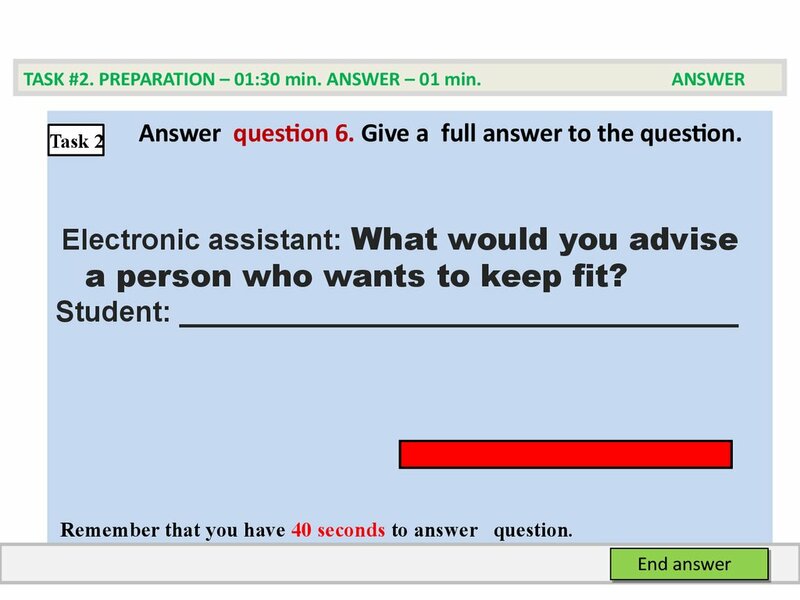 Electronic assistant: What would you advise a person who wants to keep fit? Аnswer question 1. 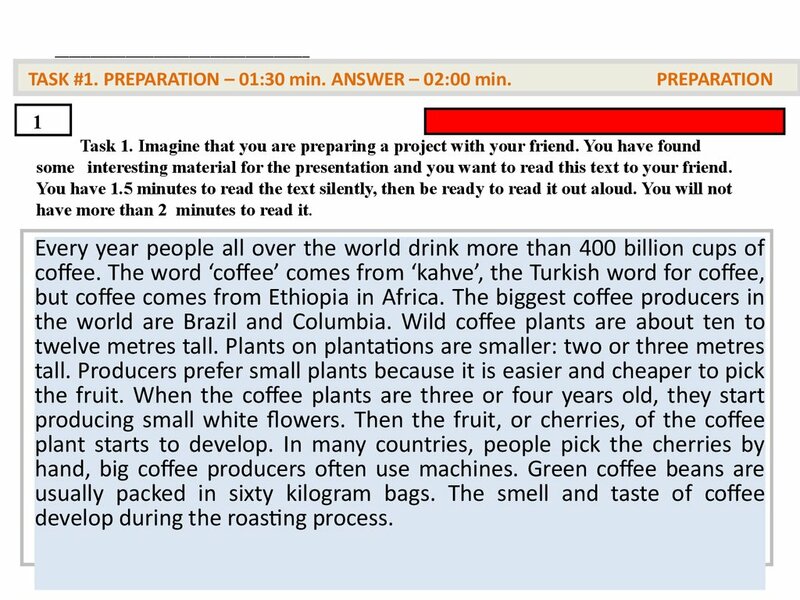 Give а full answer to the question. Remember that you have 40 seconds to answer question. 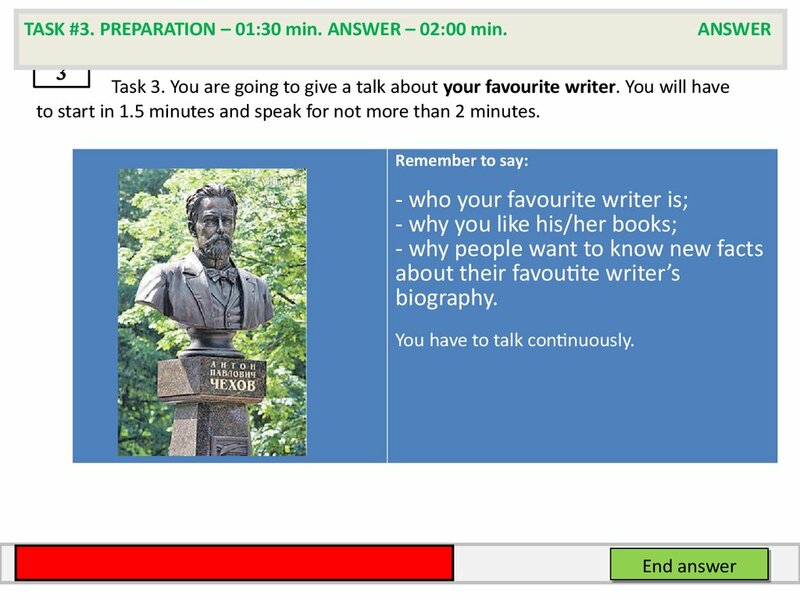 Аnswer question 2. 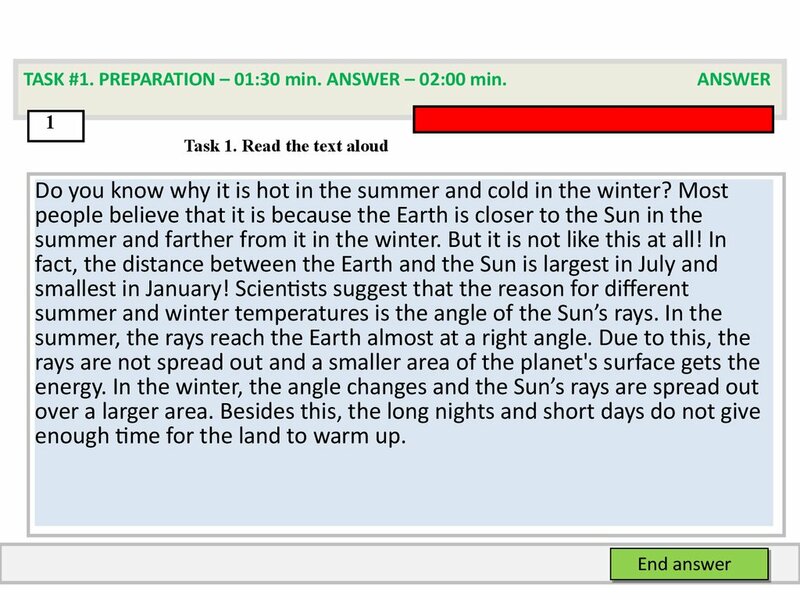 Give а full answer to the question. Answer question 3. 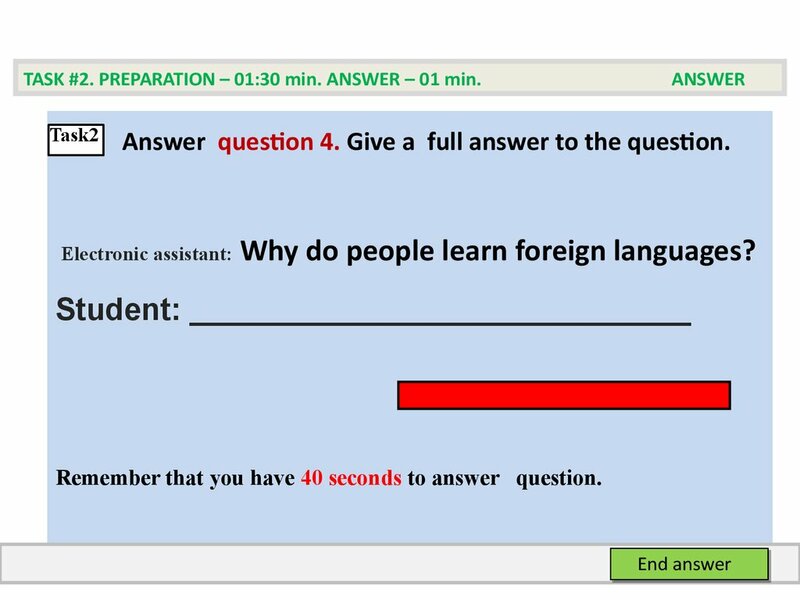 Give а full answer to the question. popular with teenagers in your region? 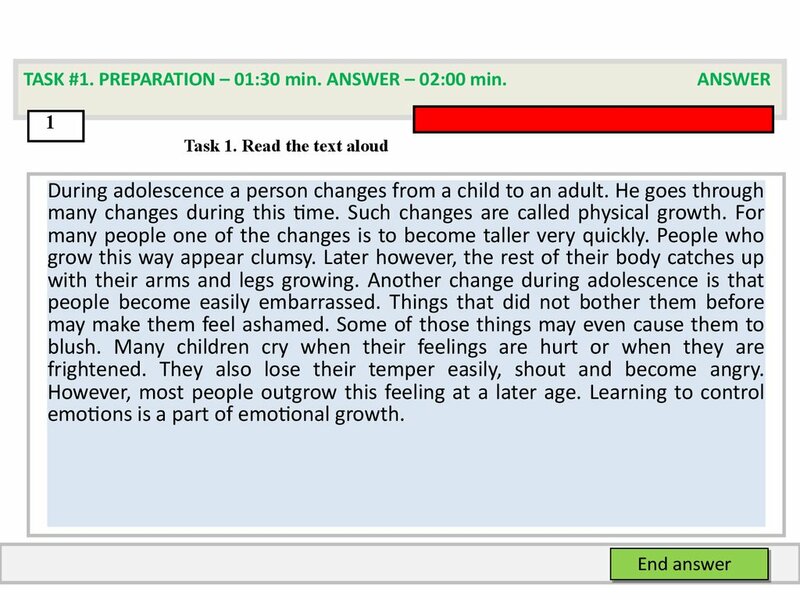 Аnswer question 4. 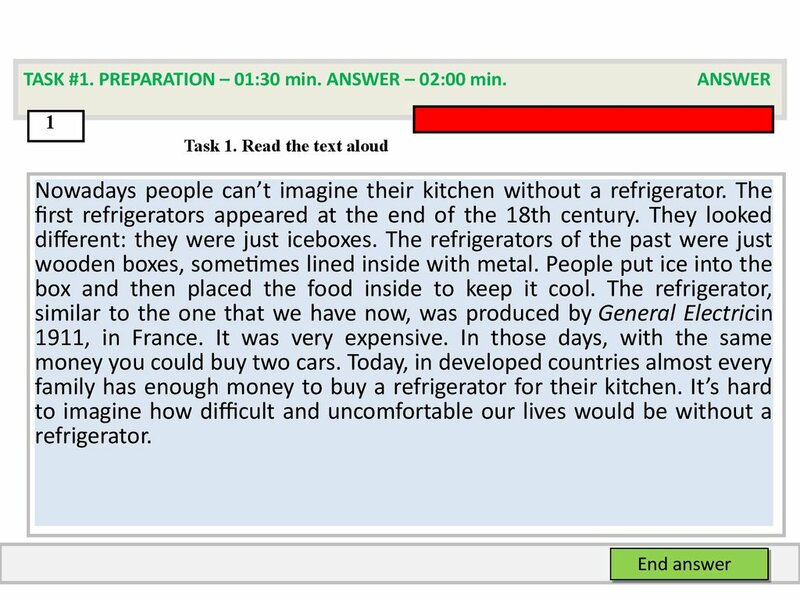 Give а full answer to the question. available in the place where you live? 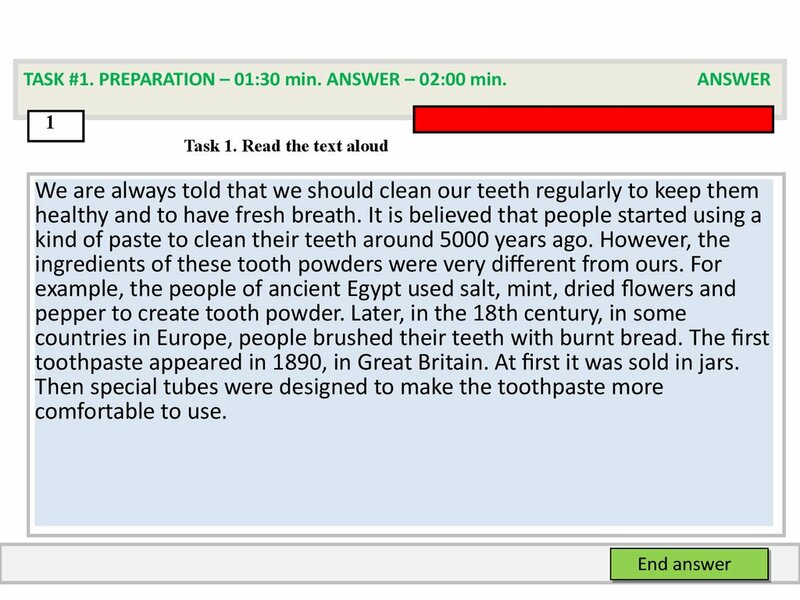 Аnswer question 5. 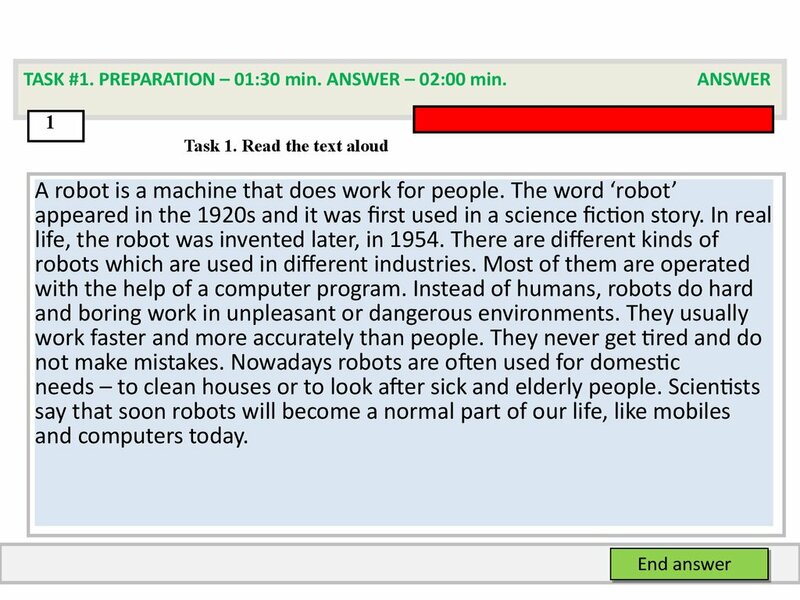 Give а full answer to the question. 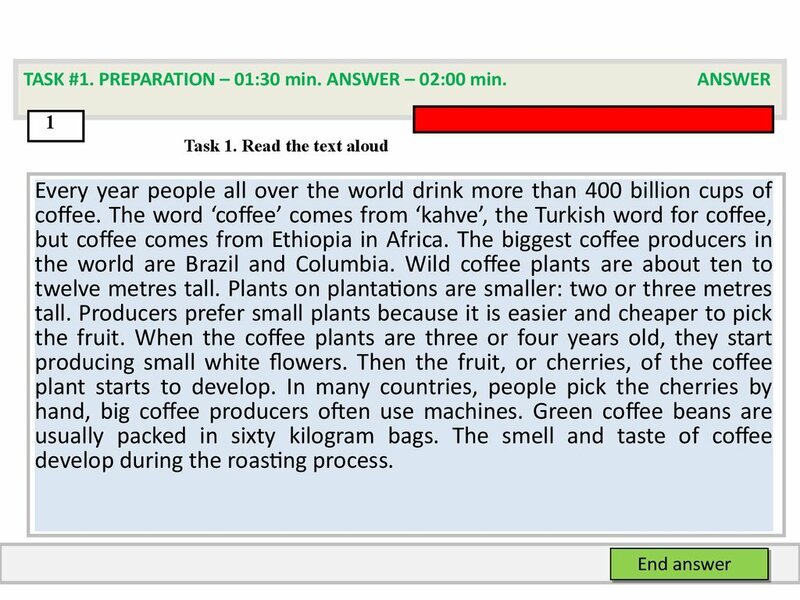 Аnswer question 6. Give а full answer to the question. 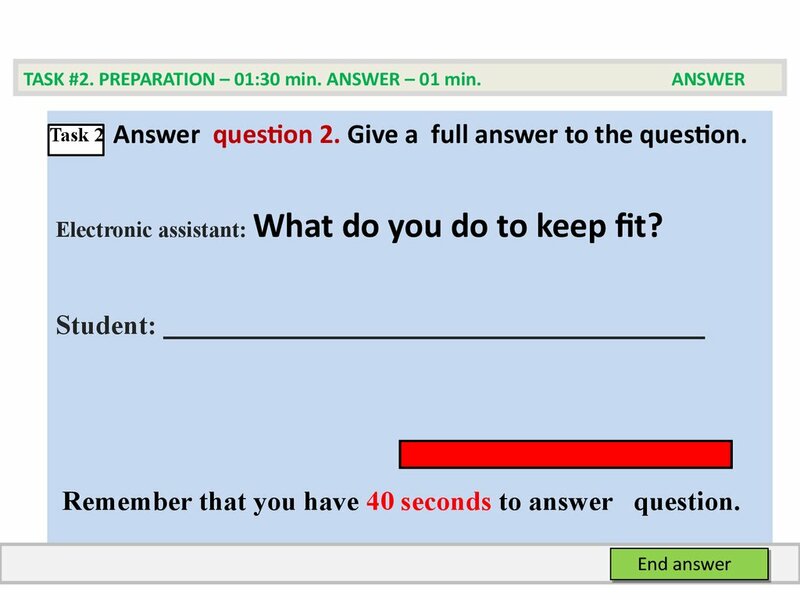 a person who wants to keep fit? 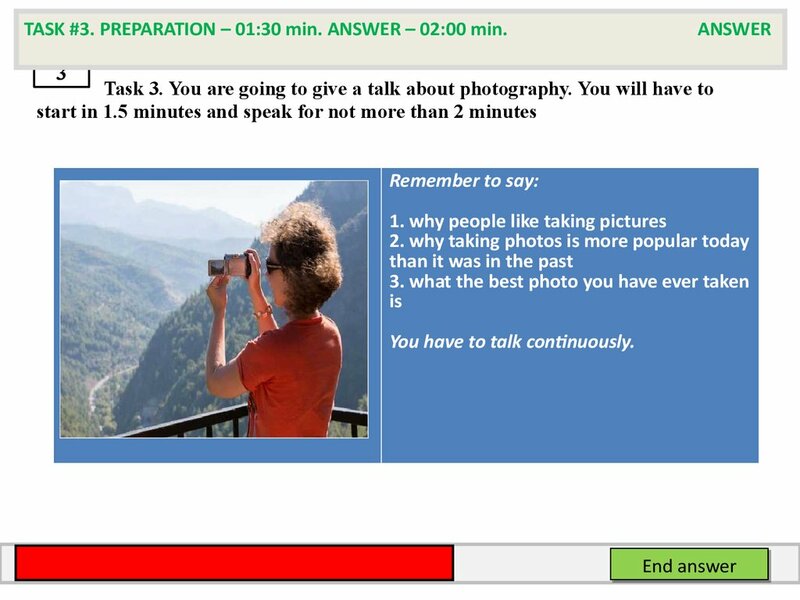 TASK #3. 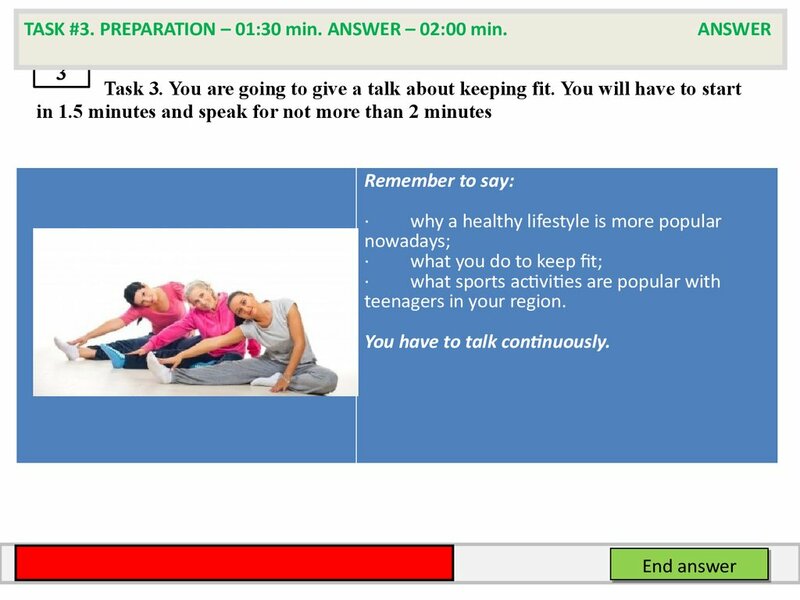 PREPARATION – 01:30 min. 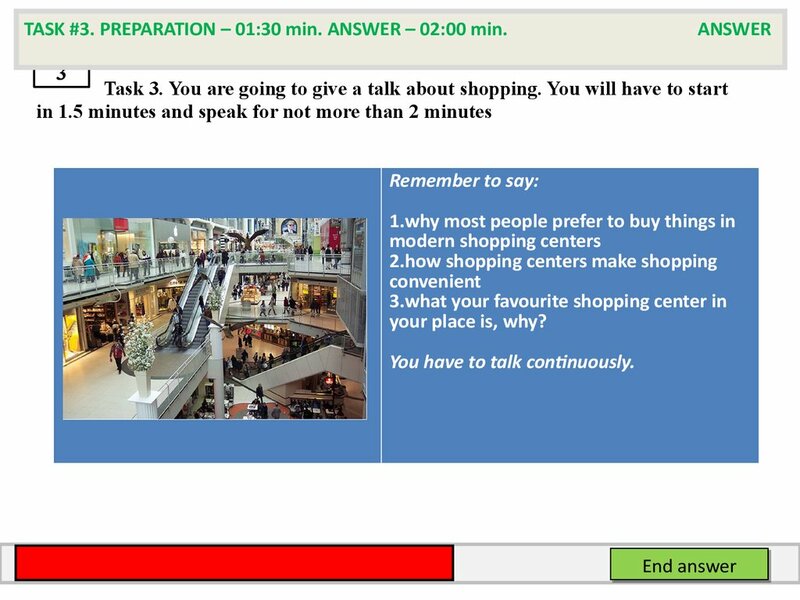 ANSWER – 02:00 min. twenty-five years, one of them is Queen Elizabeth II. family. She has three sons, one daughter, and many grandsons and granddaughters. 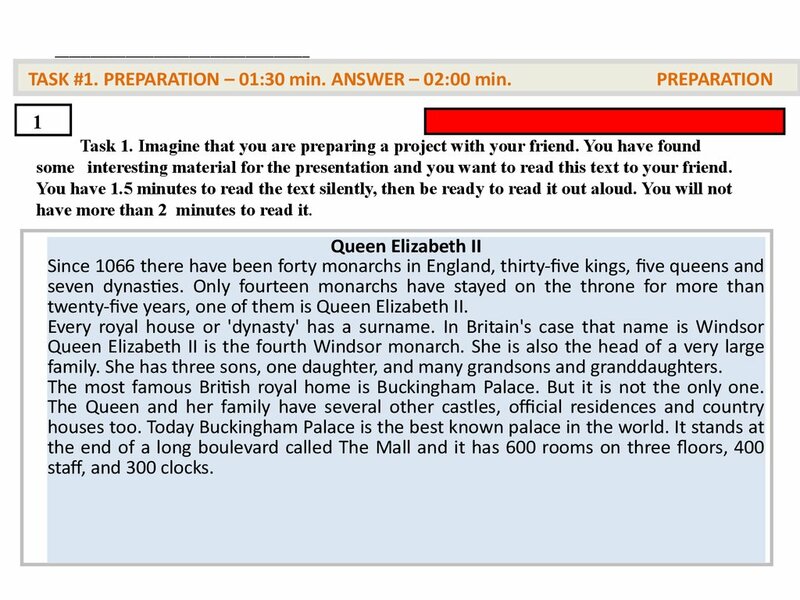 The most famous British royal home is Buckingham Palace. But it is not the only one. have to give your name. So, let’s get started. 1. Electronic assistant: What is the main purpose of school? 2. Electronic assistant: Are school years happy for you? 3. 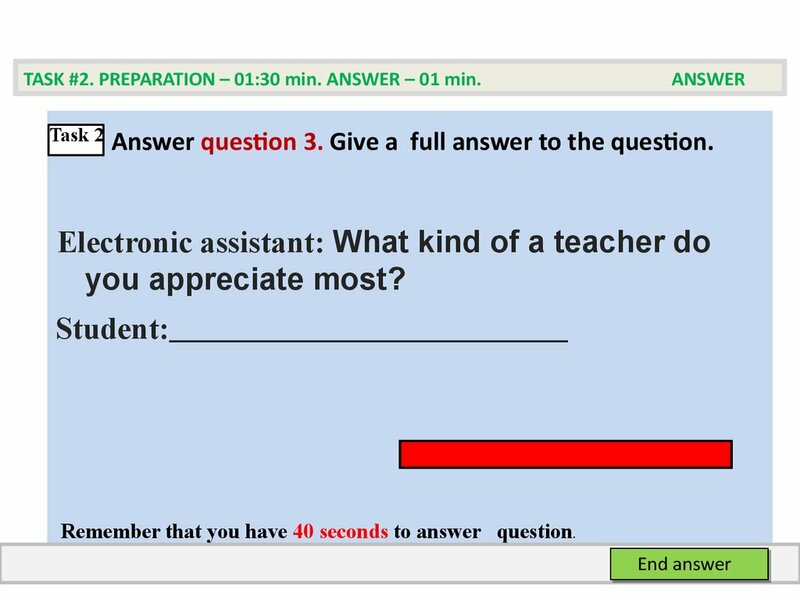 Electronic assistant: What kind of a teacher do you appreciate most? 4. Electronic assistant: What subjects are your favourite? 5. Electronic assistant: Do you have true friends in your class? 6. Electronic assistant: How can parents help children in their education? 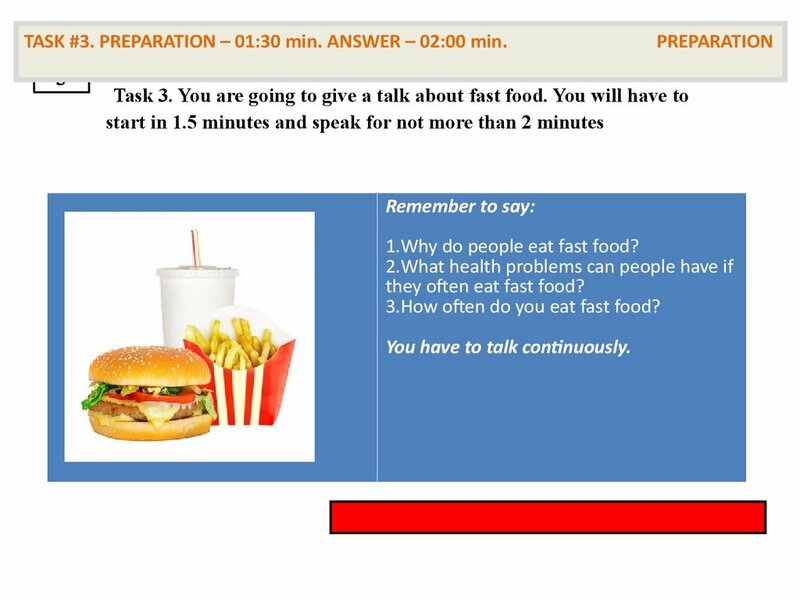 1.Why do people eat fast food? they often eat fast food? 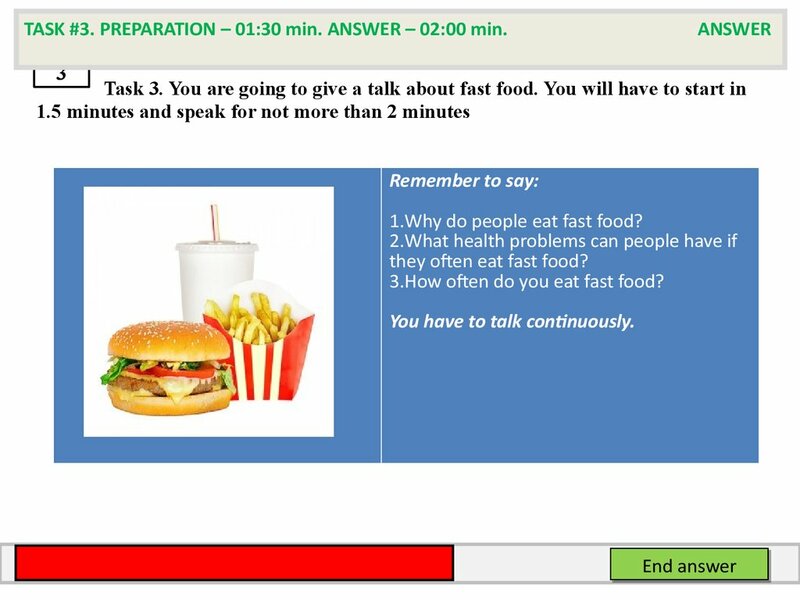 3.How often do you eat fast food? frightened. 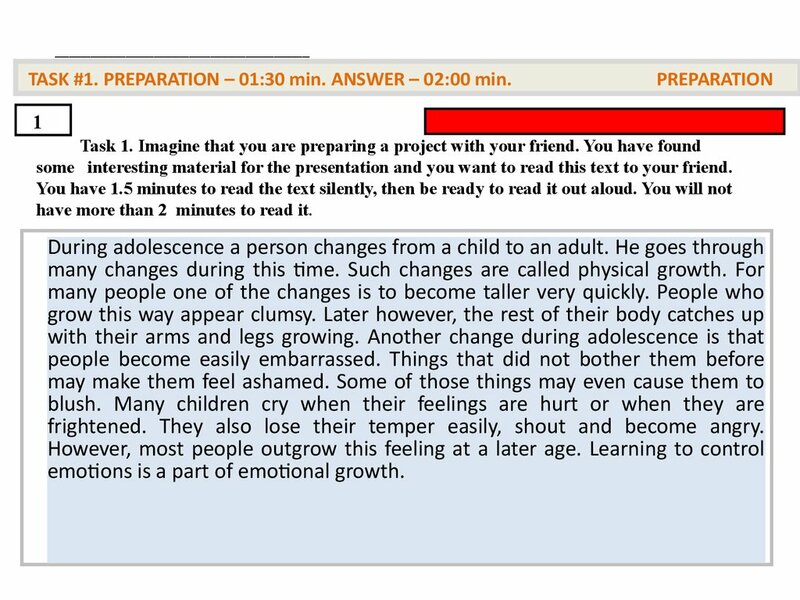 They also lose their temper easily, shout and become angry. emotions is a part of emotional growth. 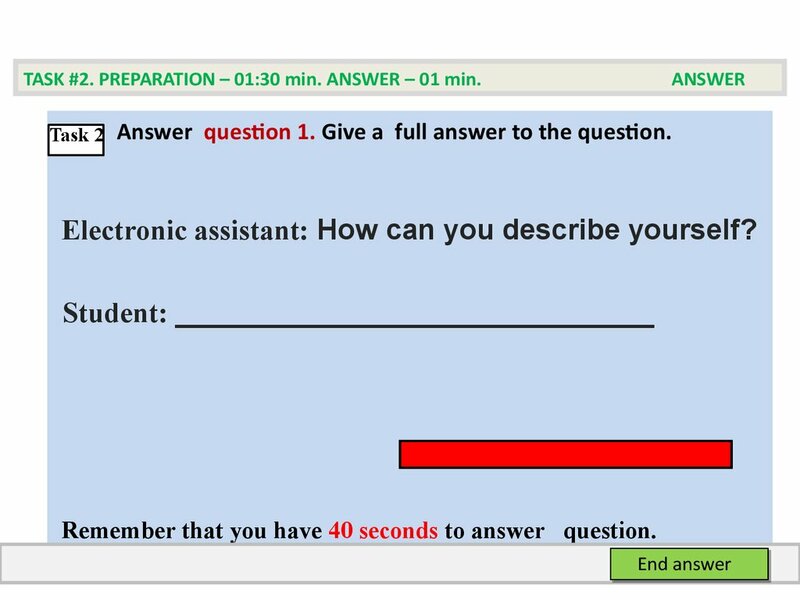 1.Electronic assistant: How can you describe yourself? 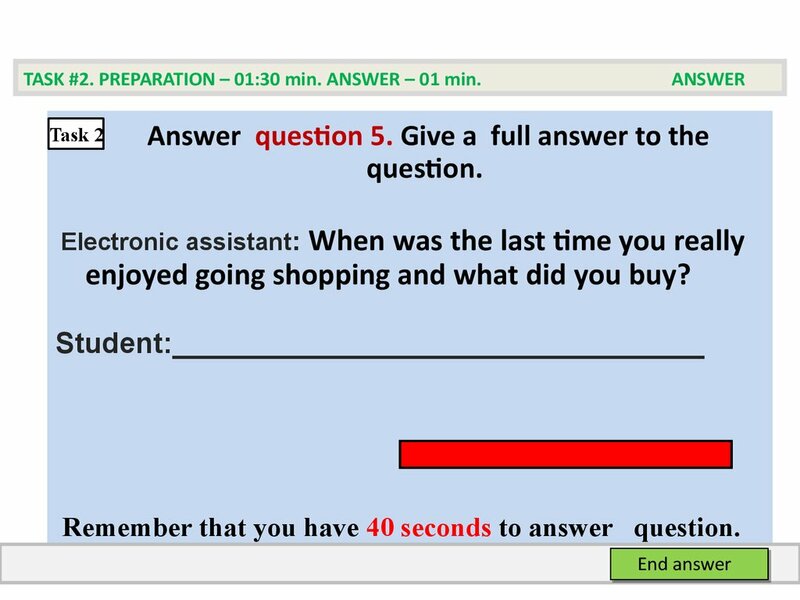 2.Electronic assistant: Who do you take after? 3. 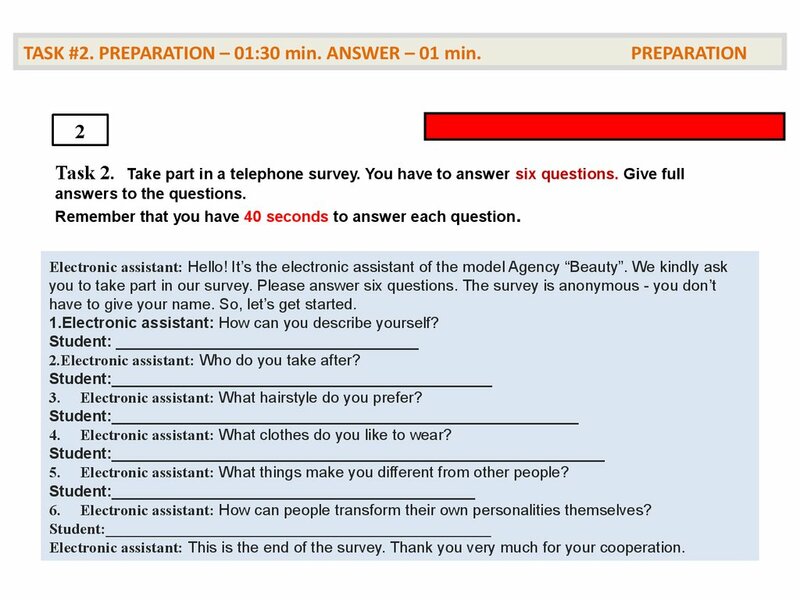 Electronic assistant: What hairstyle do you prefer? 4. Electronic assistant: What clothes do you like to wear? 5. Electronic assistant: What things make you different from other people? 6. Electronic assistant: How can people transform their own personalities themselves? 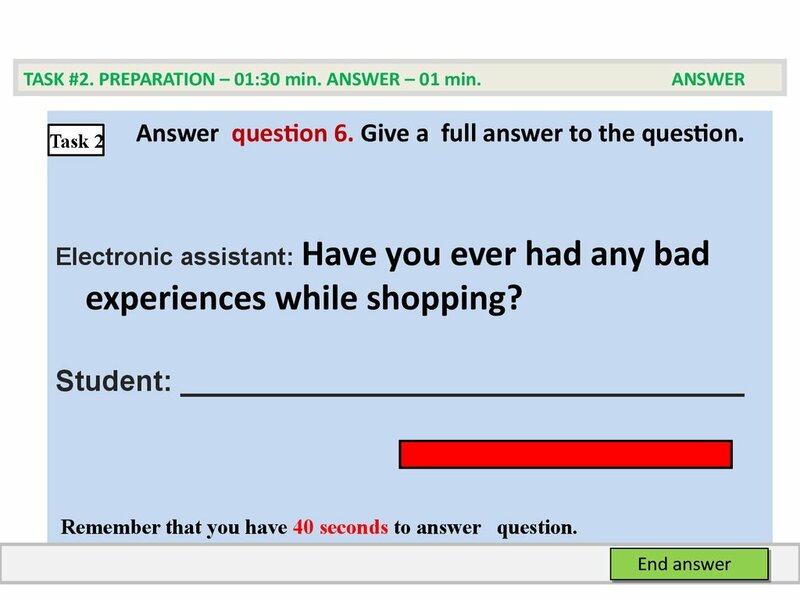 Electronic assistant: How can you describe yourself? 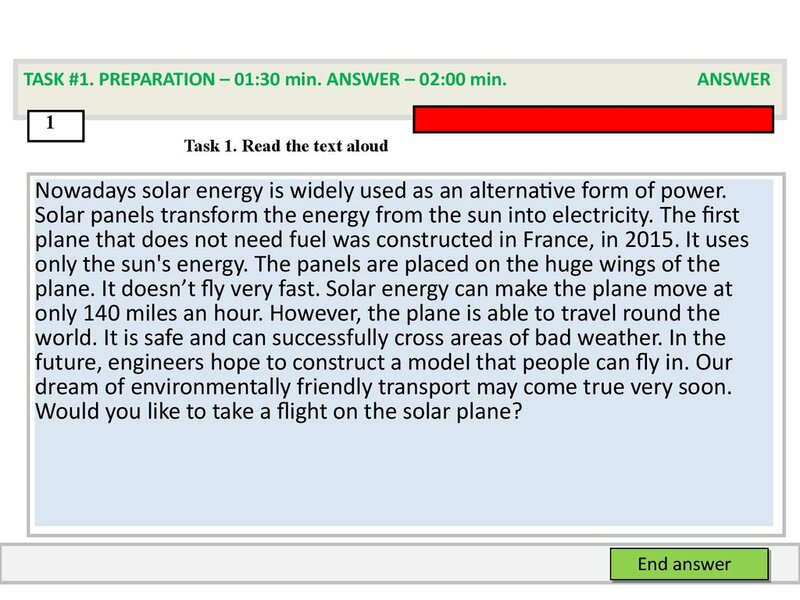 question 2. 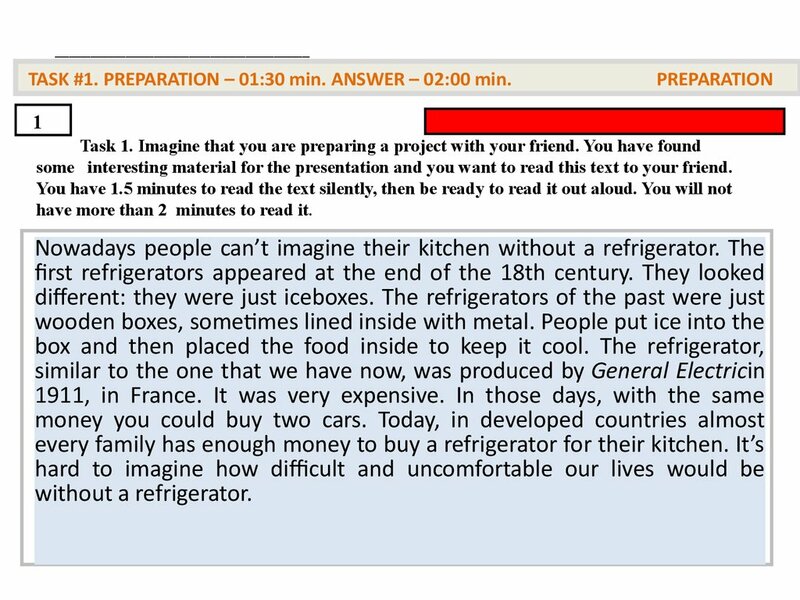 Give а full answer to the question. 2. 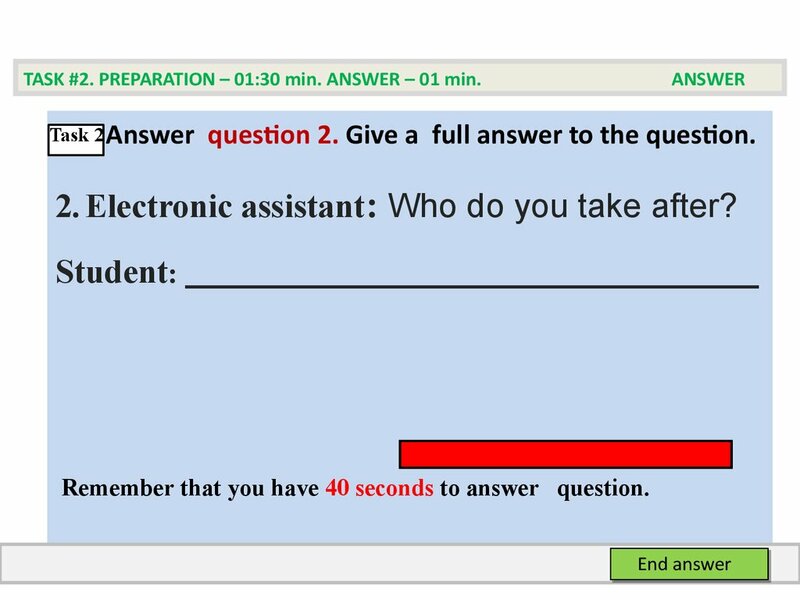 Electronic assistant: Who do you take after? Electronic assistant: What hairstyle do you prefer? Remember that you have 60 seconds to answer question. hero and mythical king of Olympia. 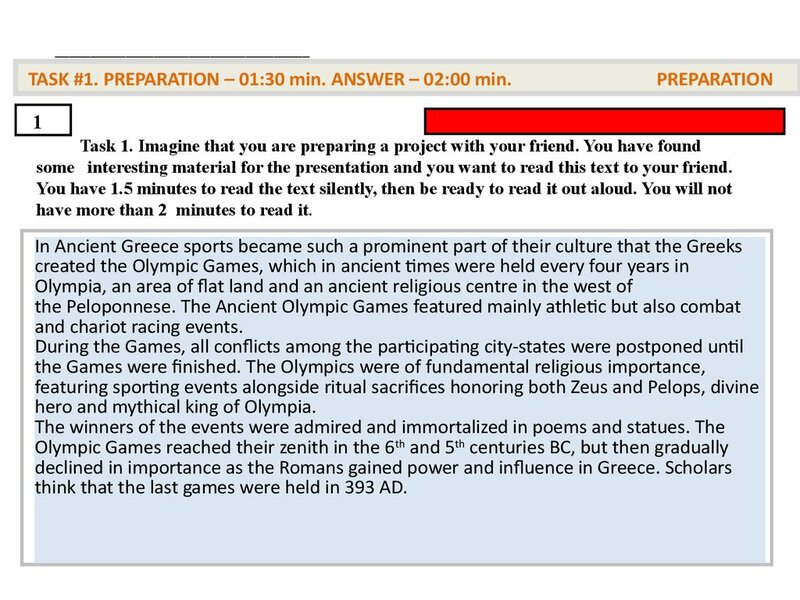 think that the last games were held in 393 AD. combat and chariot racing events. honoring both Zeus and Pelops, divine hero and mythical king of Olympia. The winners of the events were admired and immortalized in poems and statues. Greece. 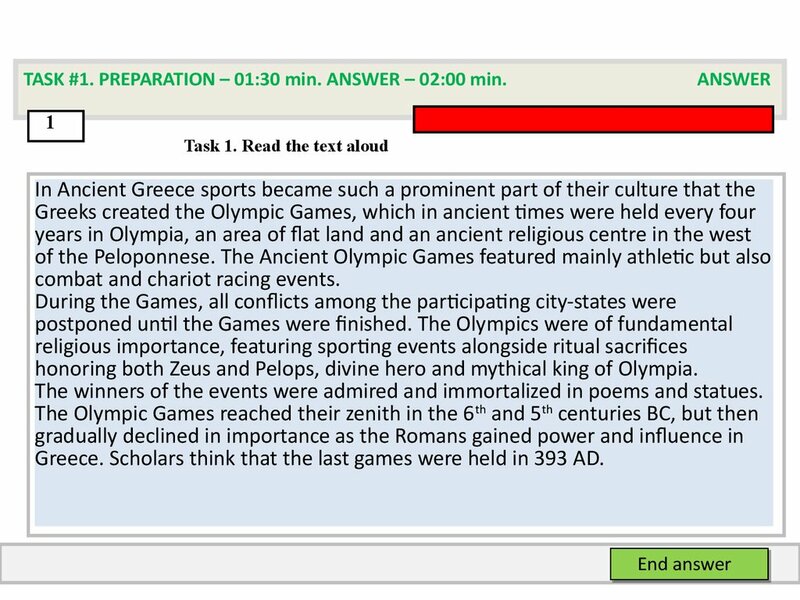 Scholars think that the last games were held in 393 AD. 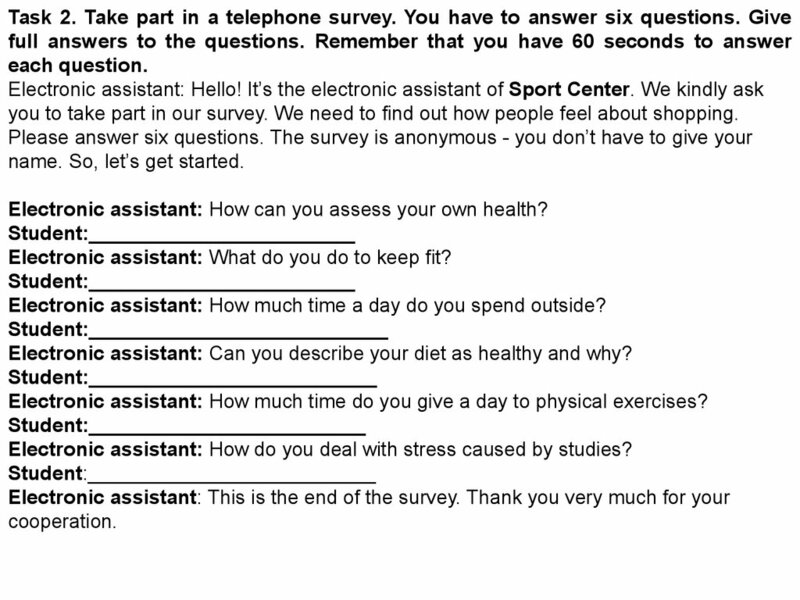 six questions. 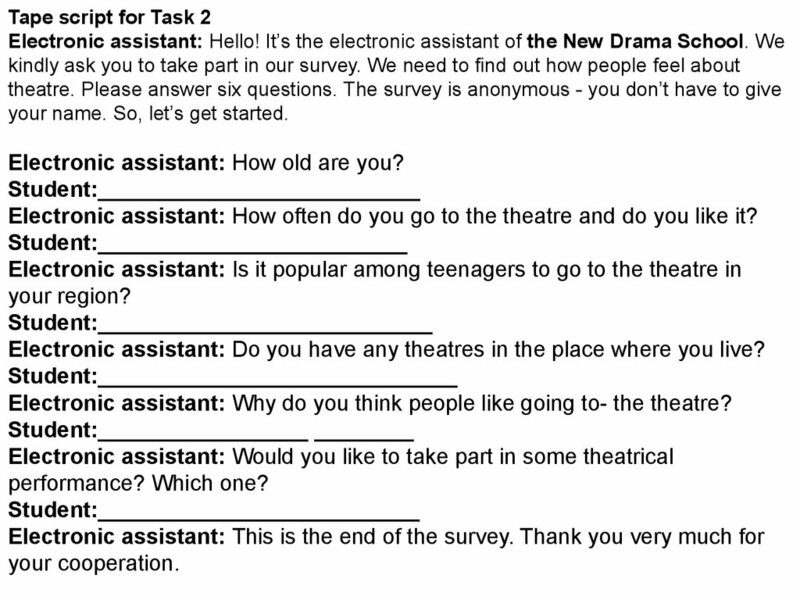 The survey is anonymous - you don’t have to give your name. So, let’s get started. 1.Electronic assistant: How old are you? 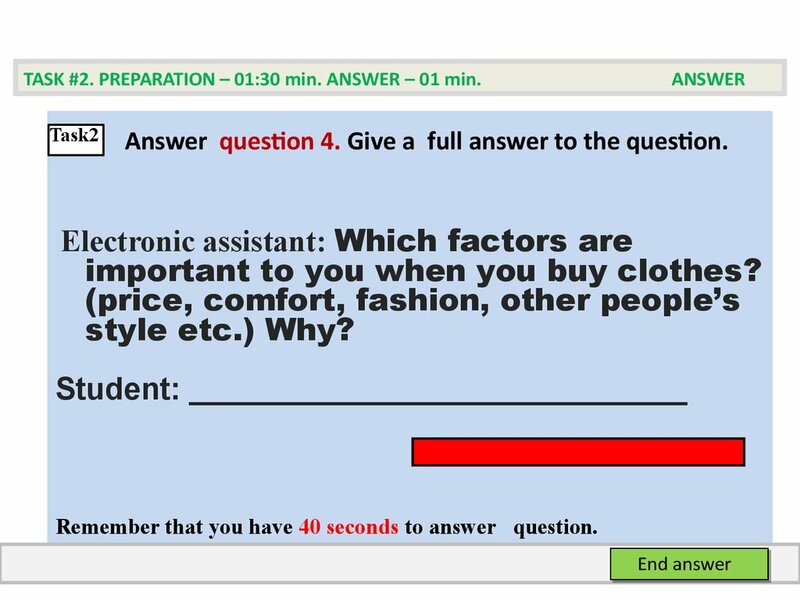 2.Electronic assistant: Do you care about clothes? 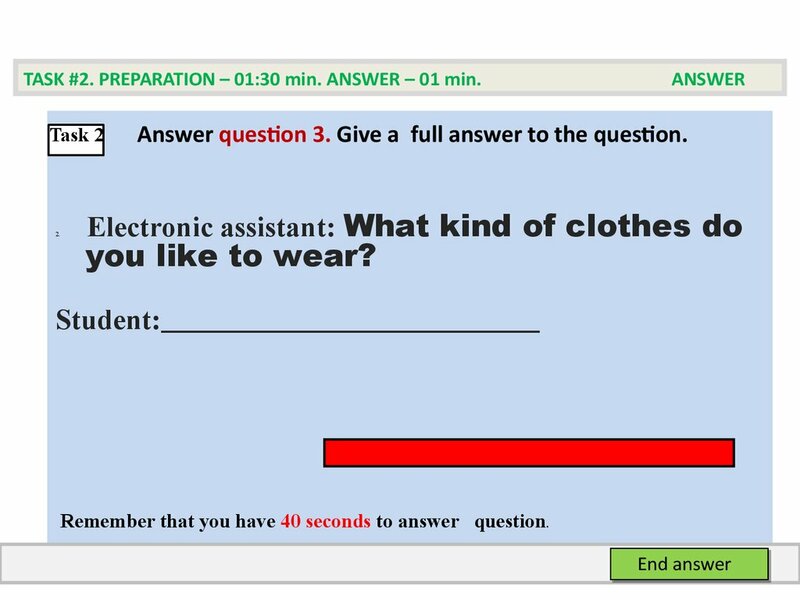 •Electronic assistant: What kind of clothes do you like to wear? fashion, other people’s style etc.) Why? 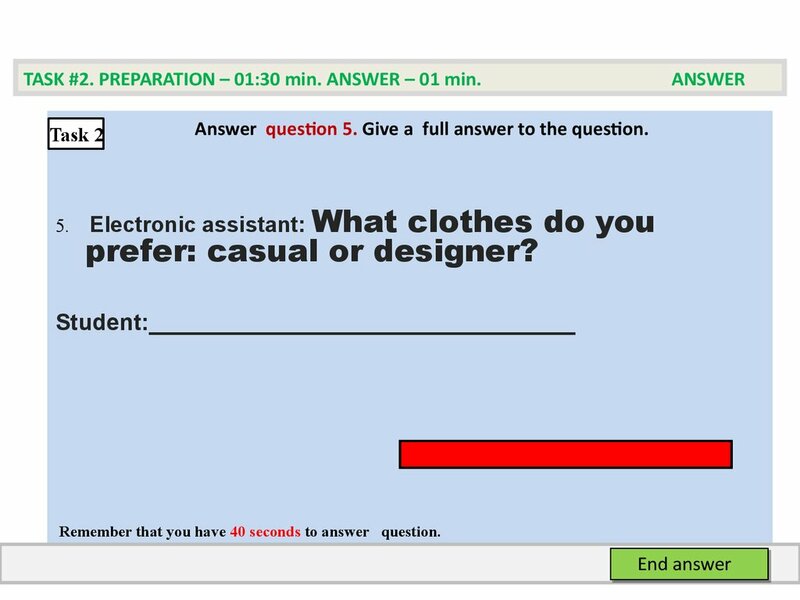 1.Electronic assistant: What clothes do you prefer: casual or designer? 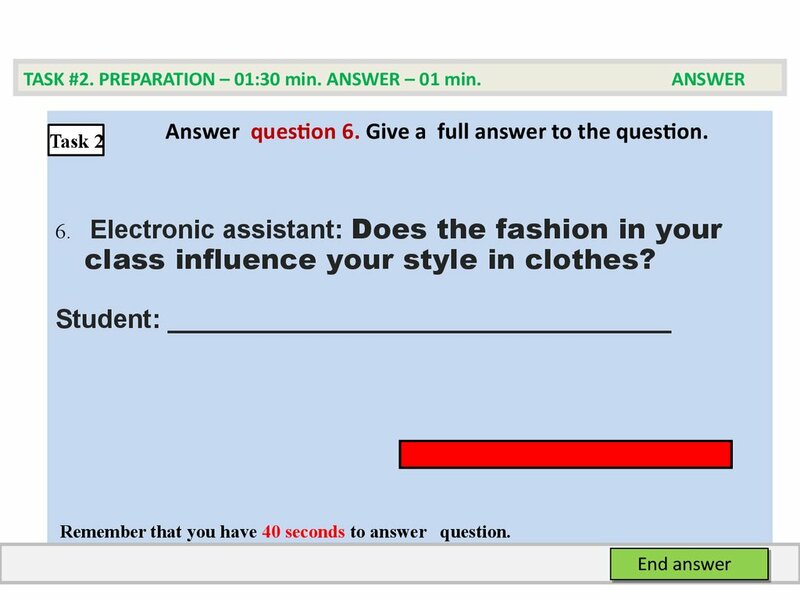 2.Electronic assistant: Does the fashion in your class influence your style in clothes? 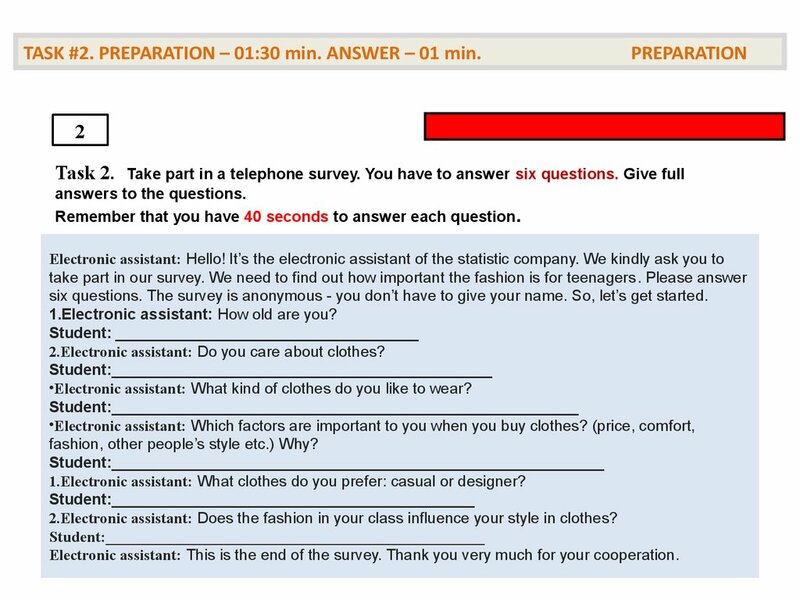 important to you when you buy clothes? class influence your style in clothes? 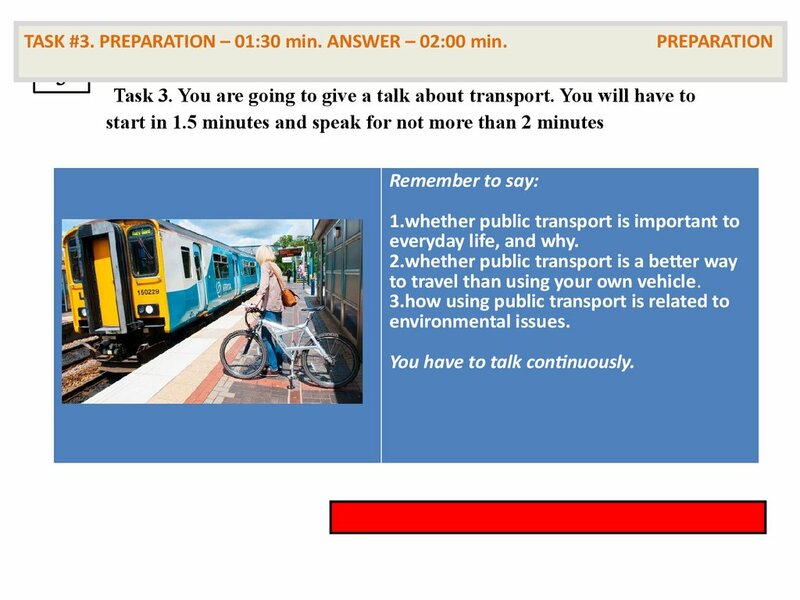 to travel than using your own vehicle. factories, more roads and airports. out, because it had no place to live. give your name. 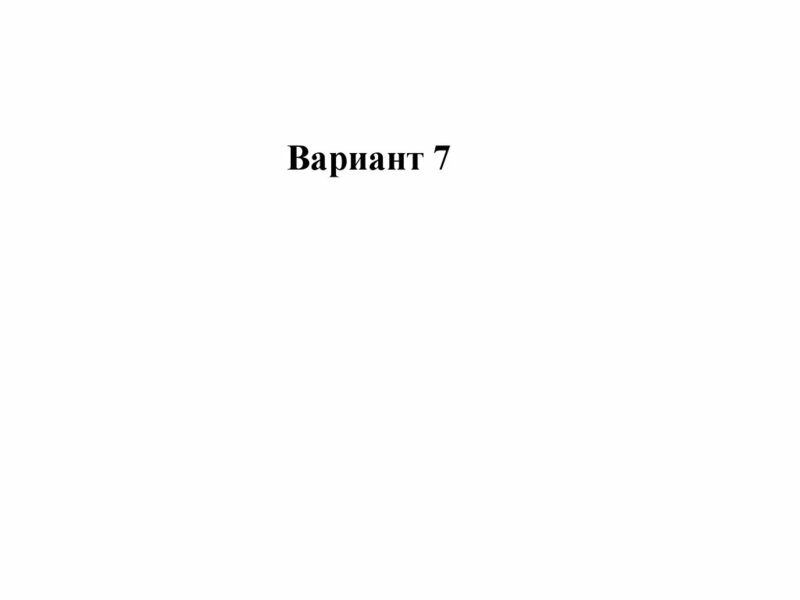 So, let’s get started. 2. 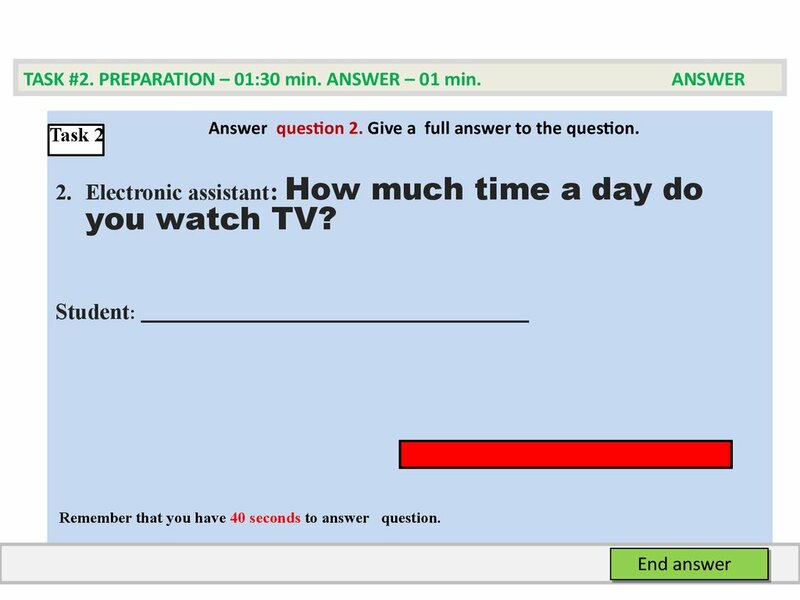 Electronic assistant: How much time a day do you watch TV? 3. 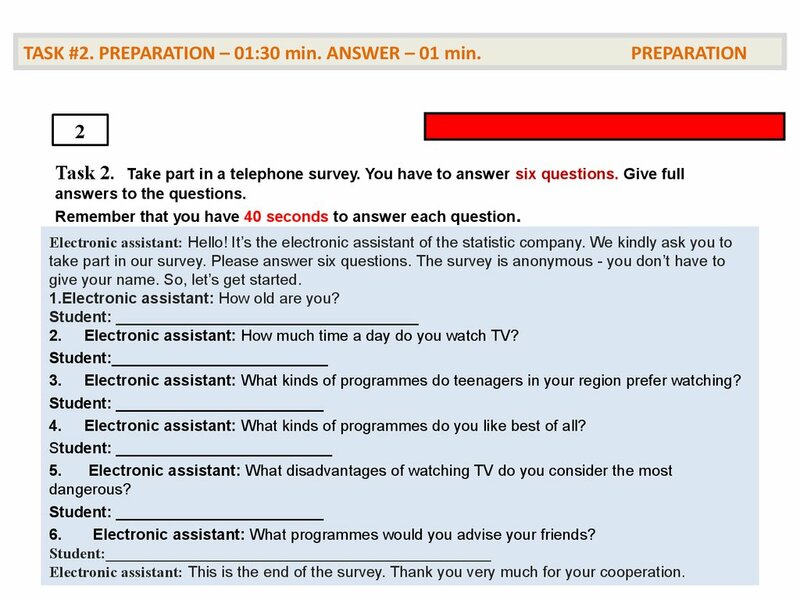 Electronic assistant: What kinds of programmes do teenagers in your region prefer watching? 4. Electronic assistant: What kinds of programmes do you like best of all? Electronic assistant: What programmes would you advise your friends? do you like best of all? 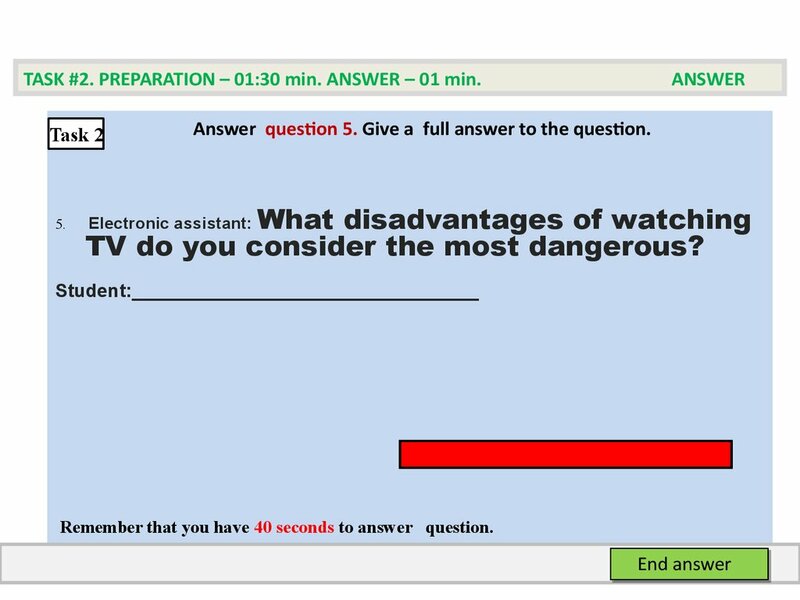 TV do you consider the most dangerous? Nowadays solar energy is widely used as an alternative form of power. 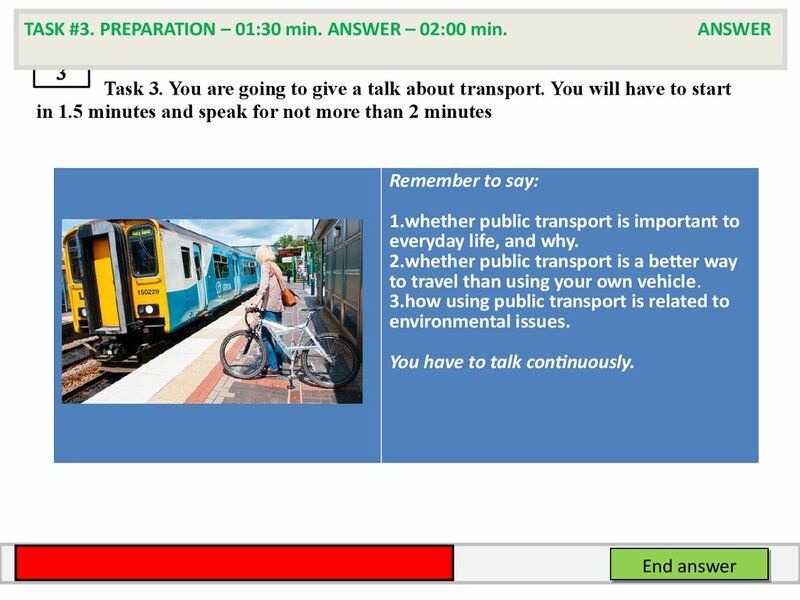 dream of environmentally friendly transport may come true very soon. 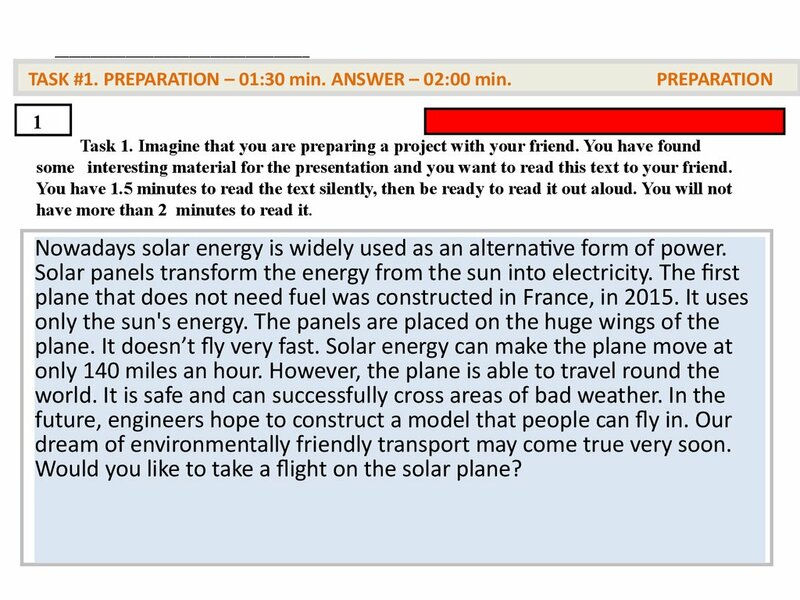 Would you like to take a flight on the solar plane? watching TV in our region. 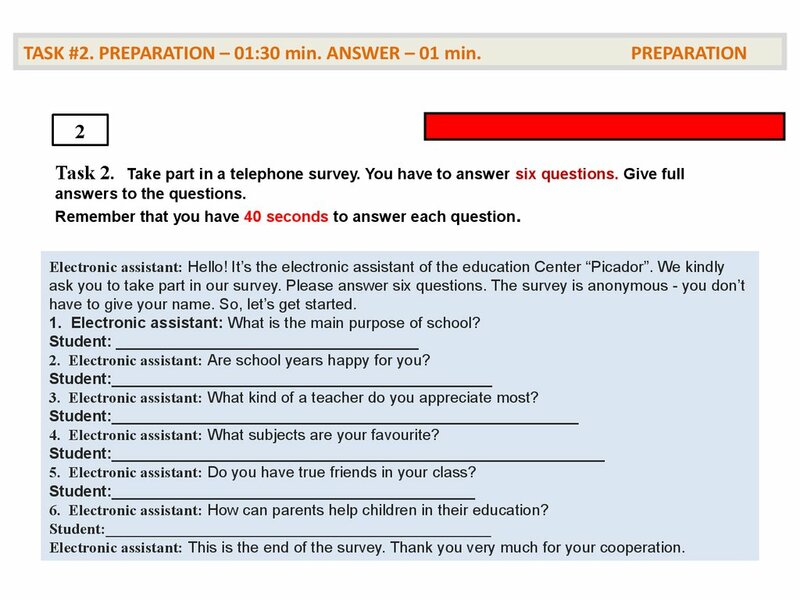 Please answer six questions. 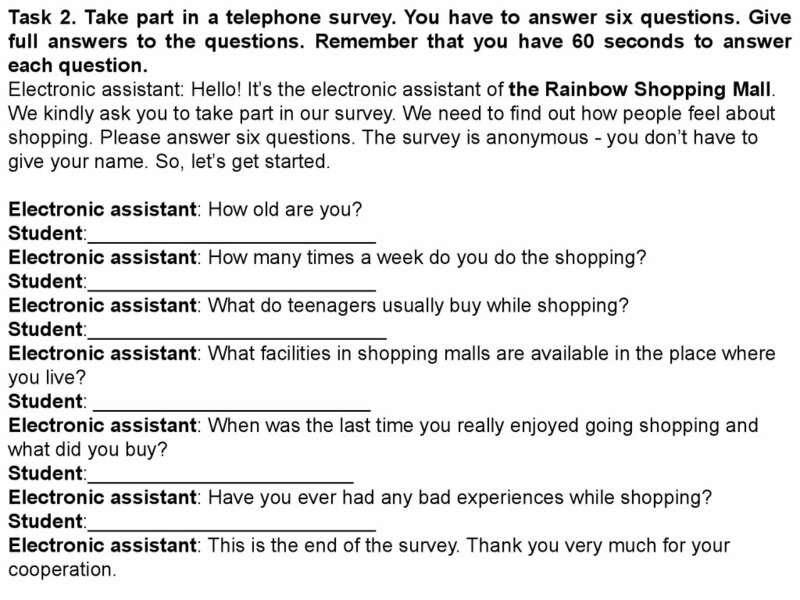 The survey is anonymous you don’t have to give your name. So, let’s get started. 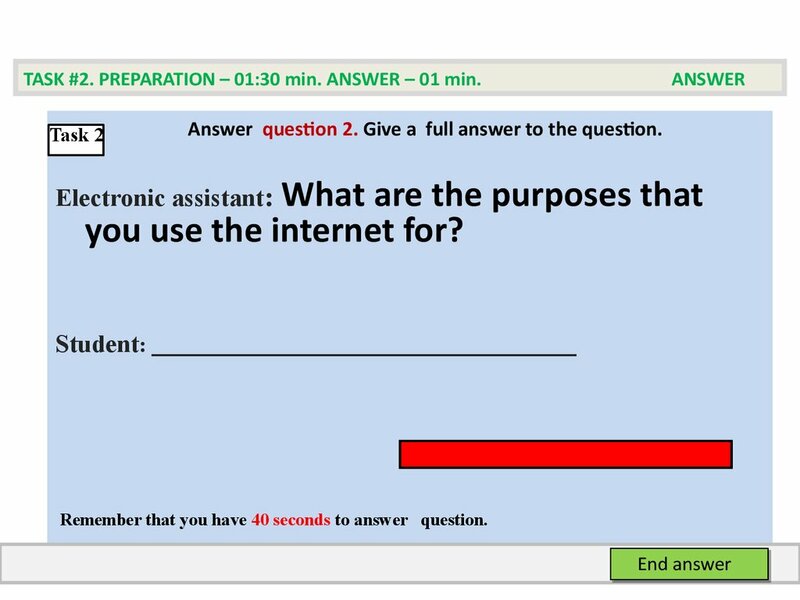 Electronic assistant: What are the purposes that you use the internet for? 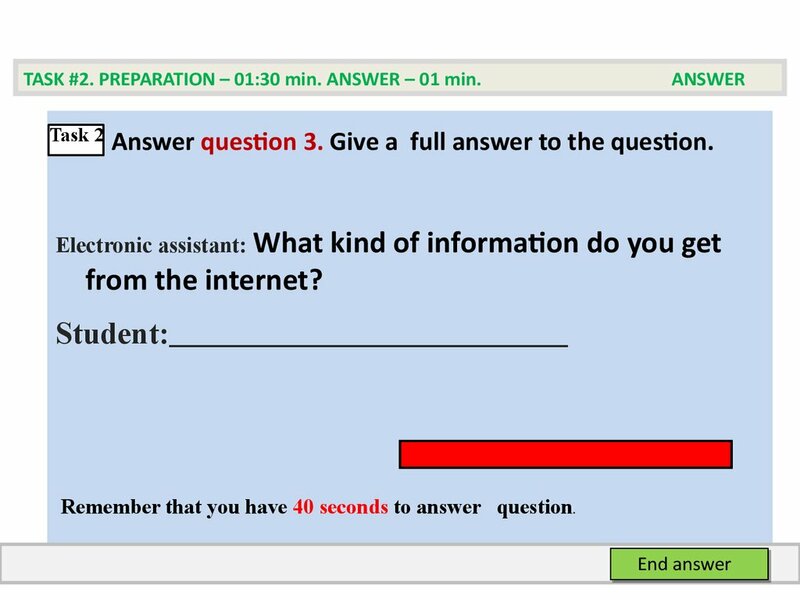 Electronic assistant: What kind of information do you get from the internet? Electronic assistant: How do you use the internet for your studies? 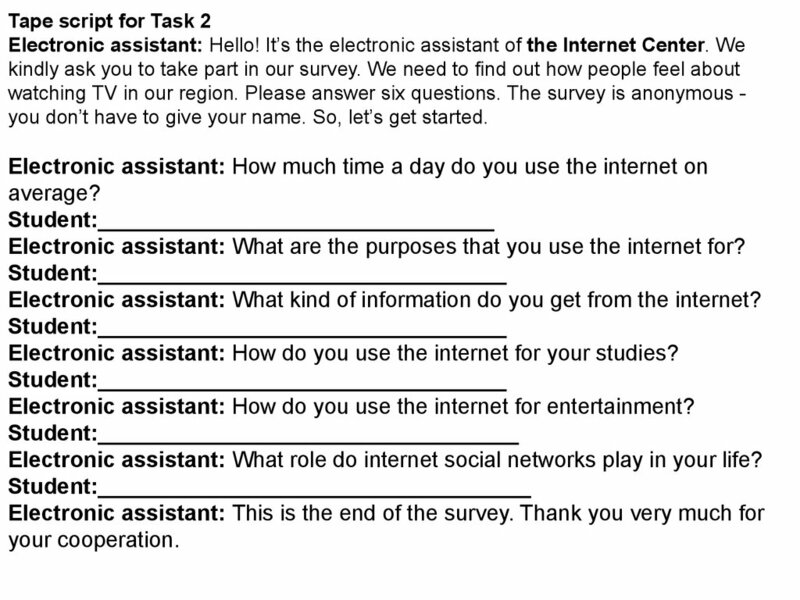 Electronic assistant: How do you use the internet for entertainment? Electronic assistant: What role do internet social networks play in your life? you use the internet for? networks play in your life? 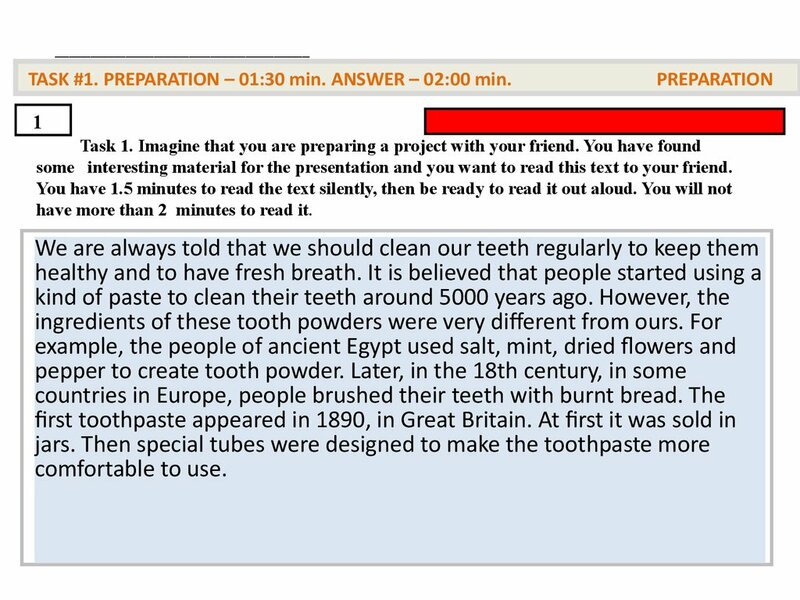 toothpaste appeared in 1890, in Great Britain. At first it was sold in jars. anonymous - you don’t have to give your name. So, let’s get started. 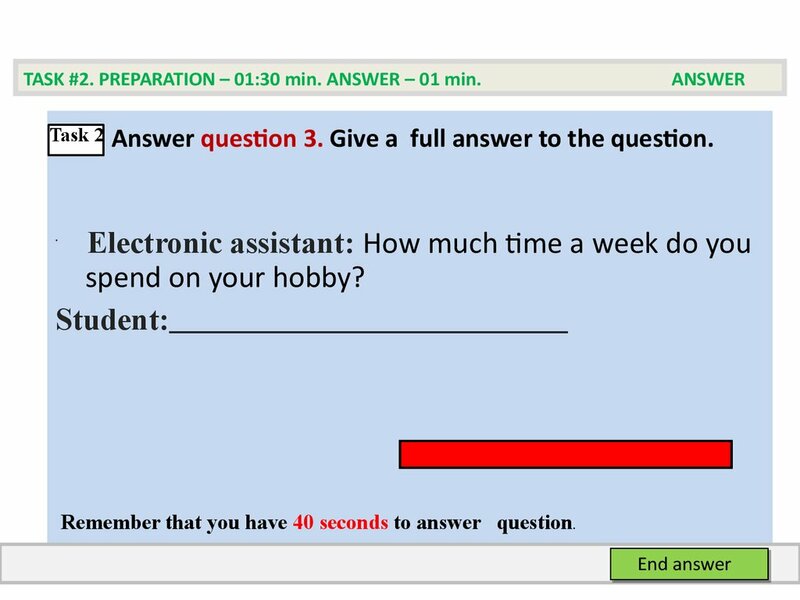 Electronic assistant: How much time a week do you spend on your hobby? 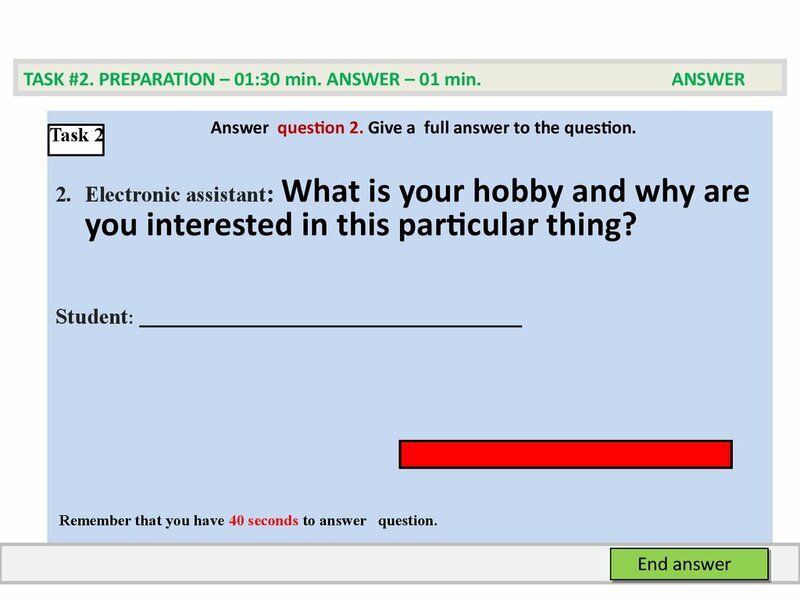 Electronic assistant: Why do you think people take up hobbies? you interested in this particular thing? 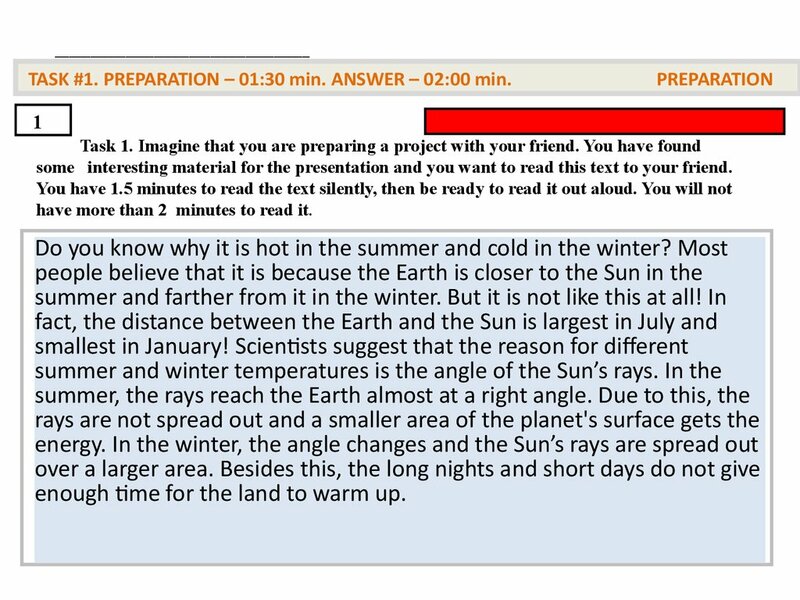 enough time for the land to warm up. your name. 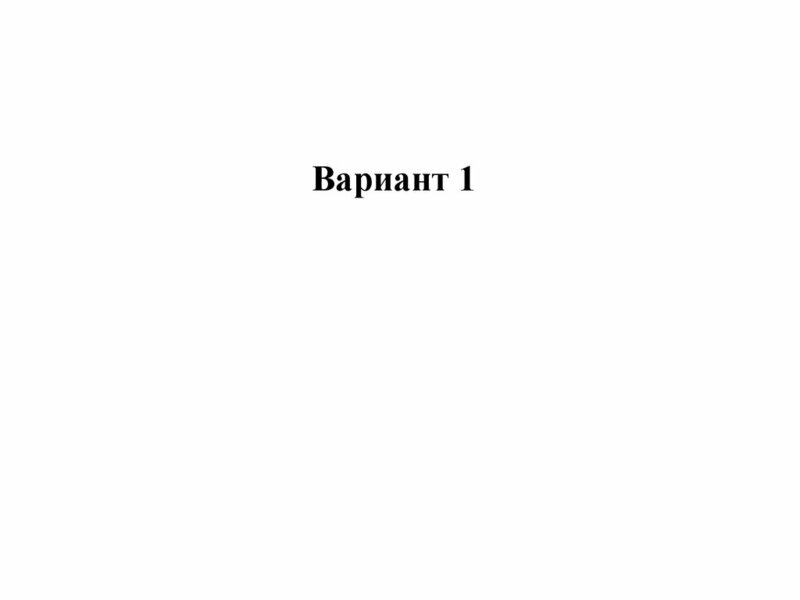 So, let’s get started. Electronic assistant: How often do you listen to music? the moment and which ones? 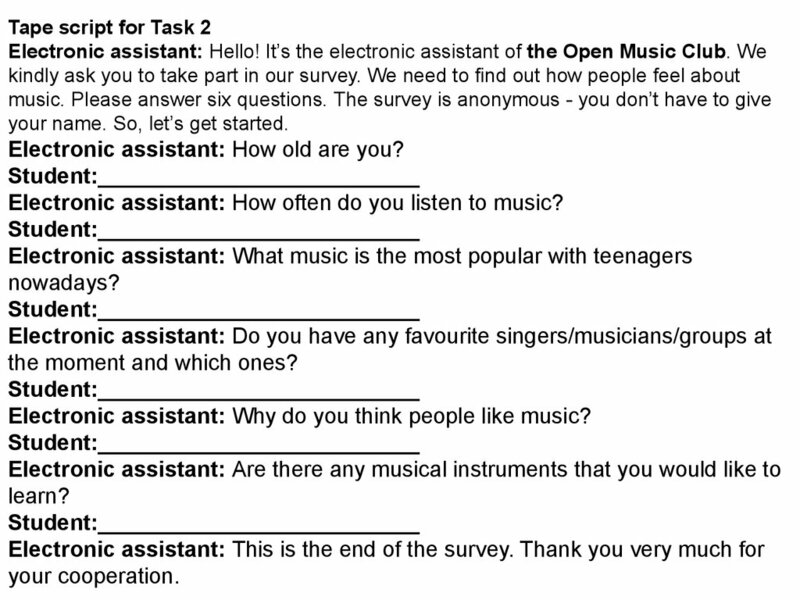 Electronic assistant: Why do you think people like music? Why do you think people like music? 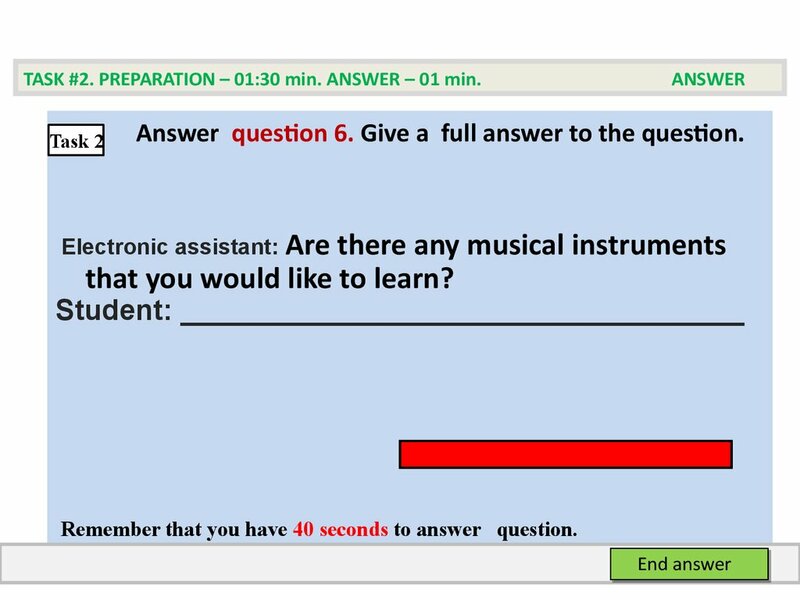 that you would like to learn? 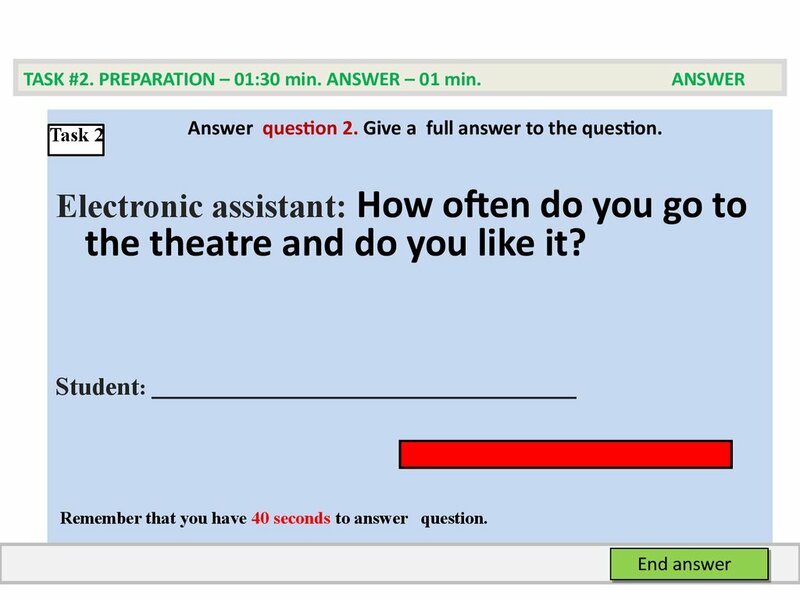 Electronic assistant: How often do you go to the theatre and do you like it? Electronic assistant: Do you have any theatres in the place where you live? Electronic assistant: Why do you think people like going to- the theatre? the theatre and do you like it? the theatre in your region? 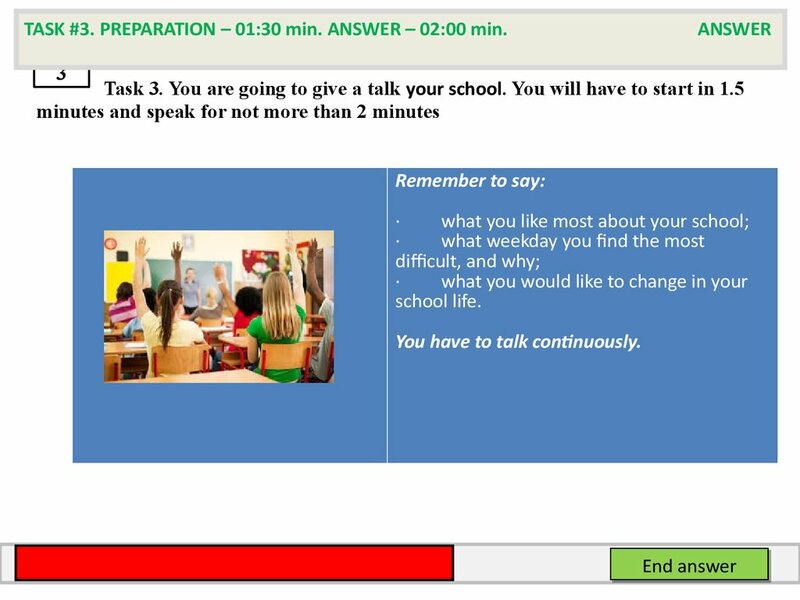 have to start in 1.5 minutes and speak for not more than 2 minutes. 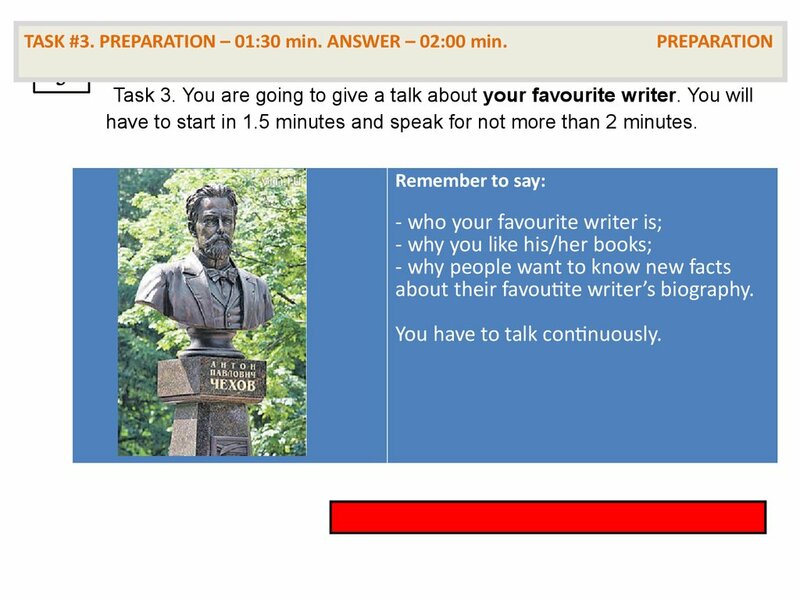 about their favoutite writer’s biography. 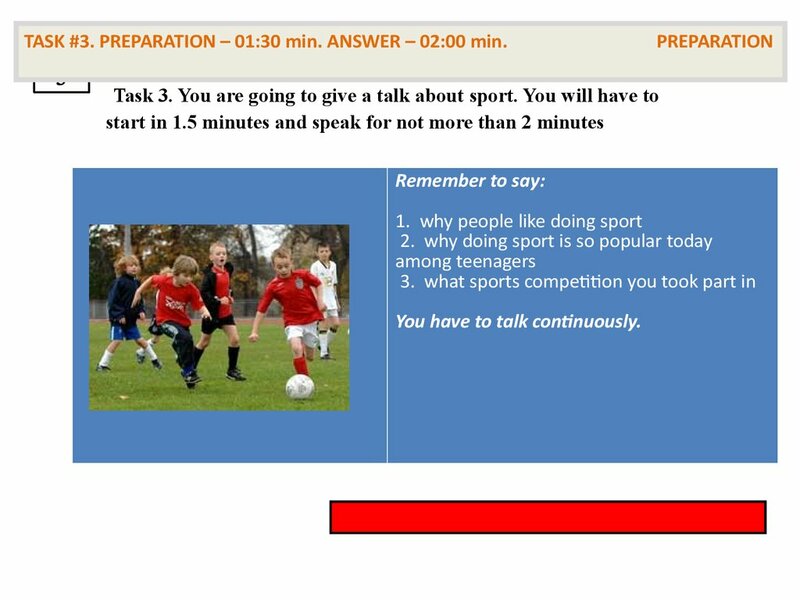 to start in 1.5 minutes and speak for not more than 2 minutes. develop during the roasting process. 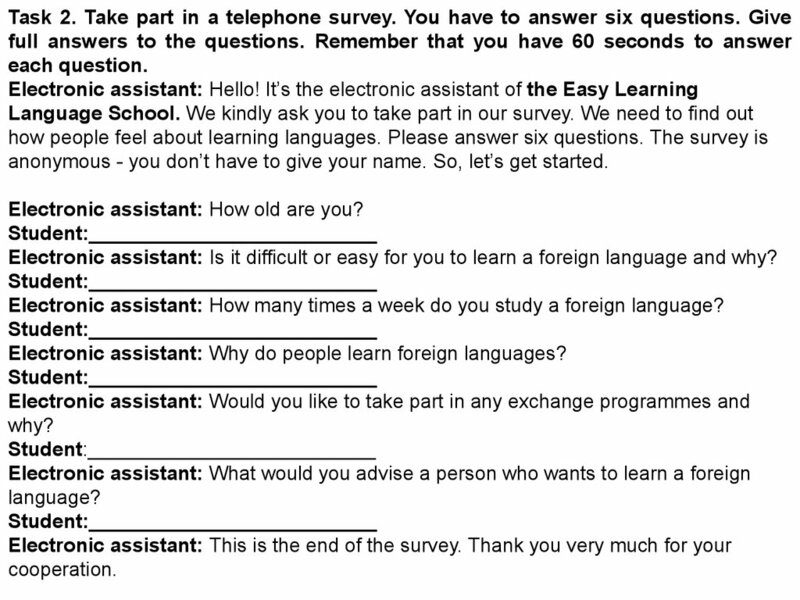 Electronic assistant: Is it difficult or easy for you to learn a foreign language and why? 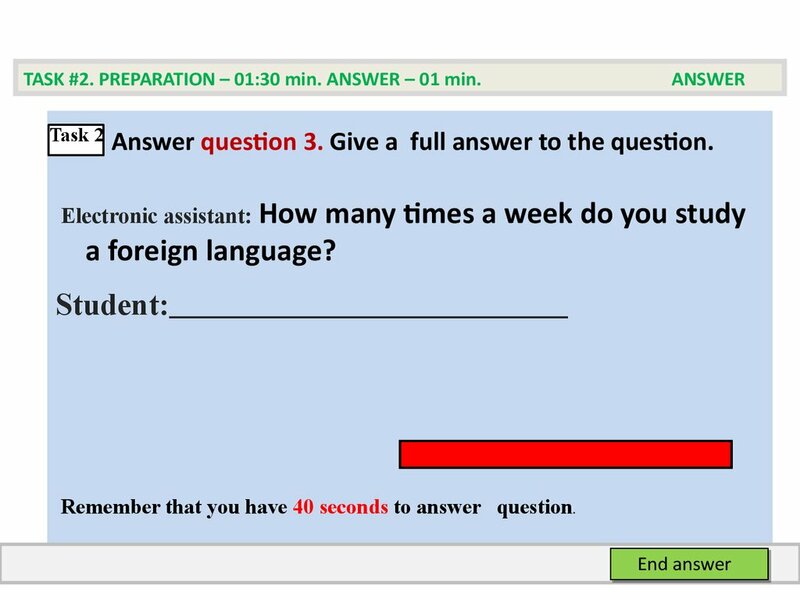 Electronic assistant: How many times a week do you study a foreign language? 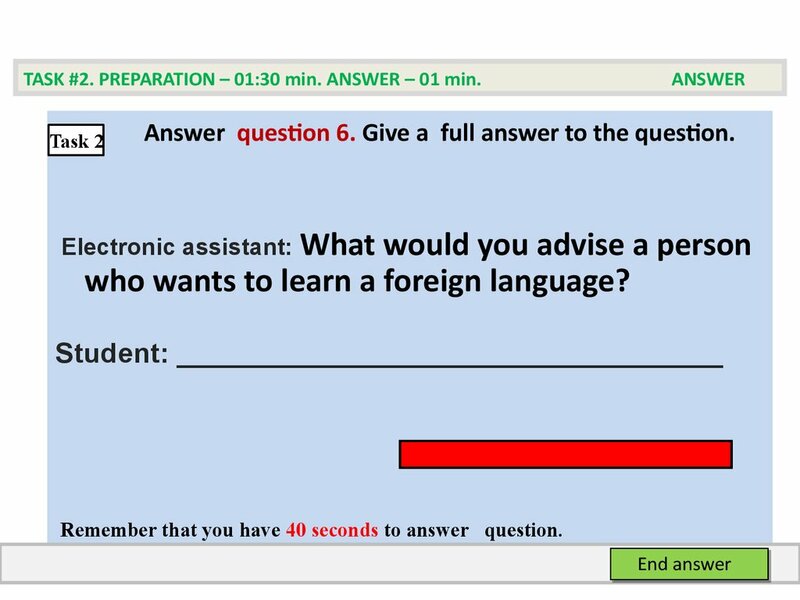 Electronic assistant: Why do people learn foreign languages? 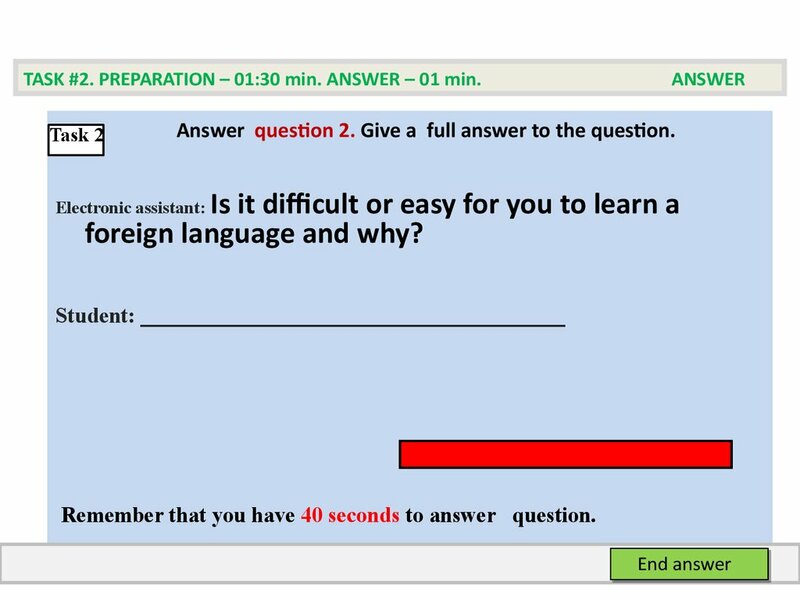 who wants to learn a foreign language? 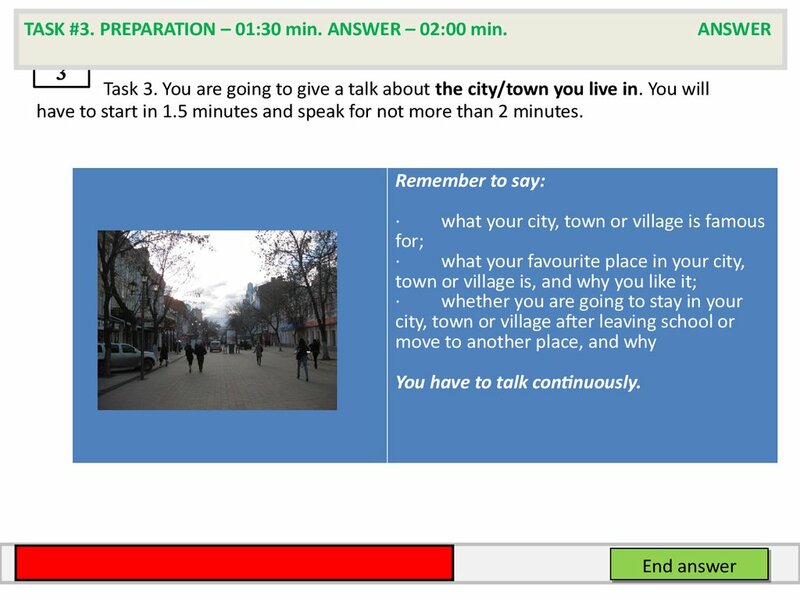 Task 3. 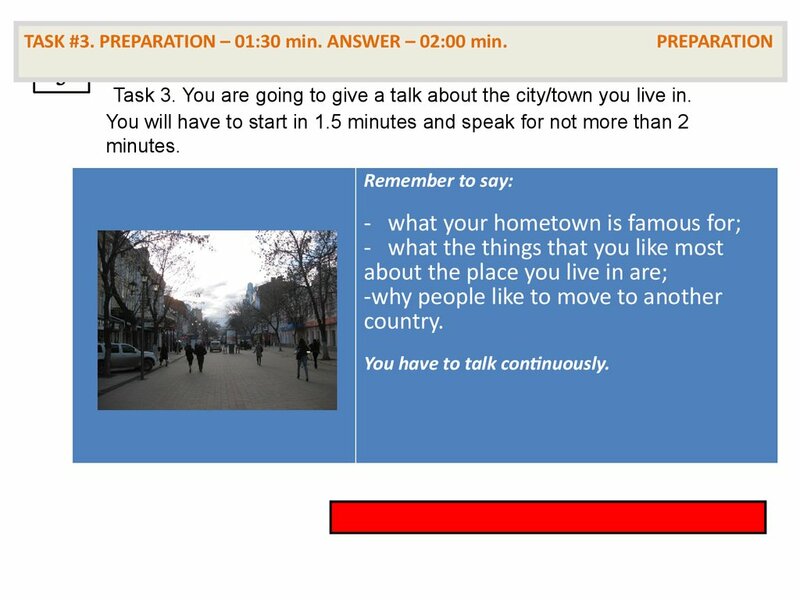 You are going to give a talk about the city/town you live in.